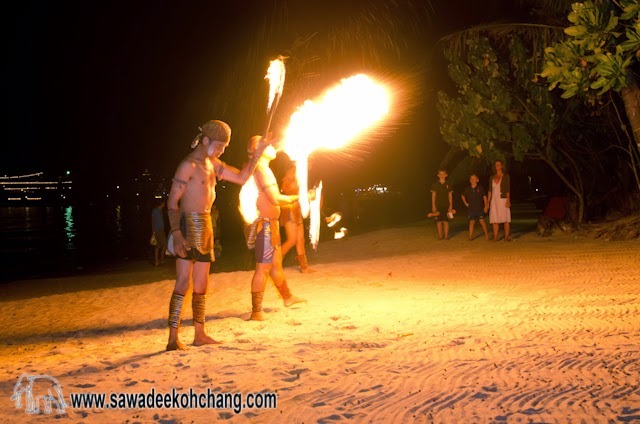 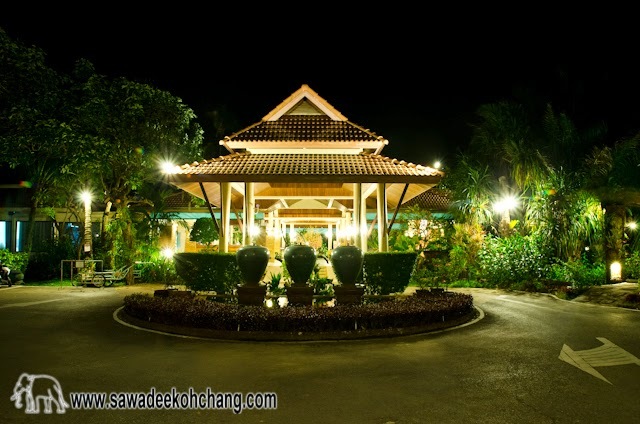 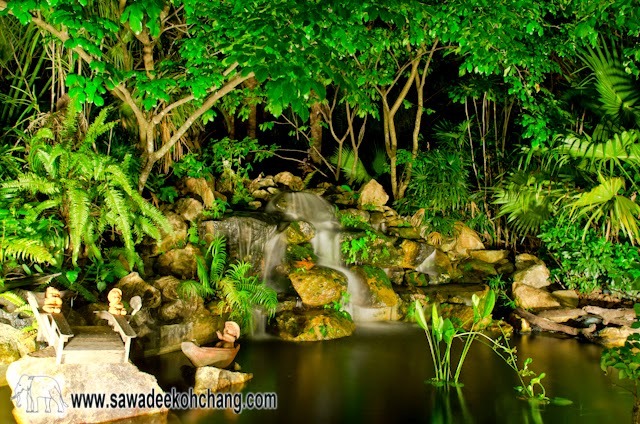 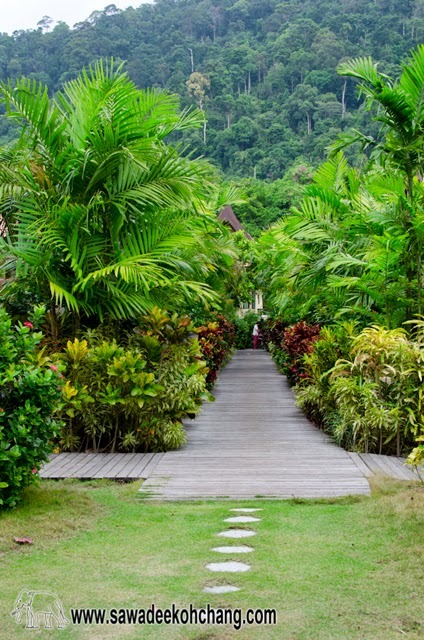 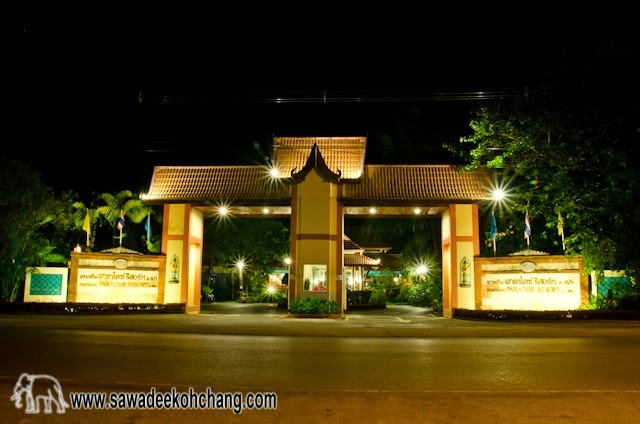 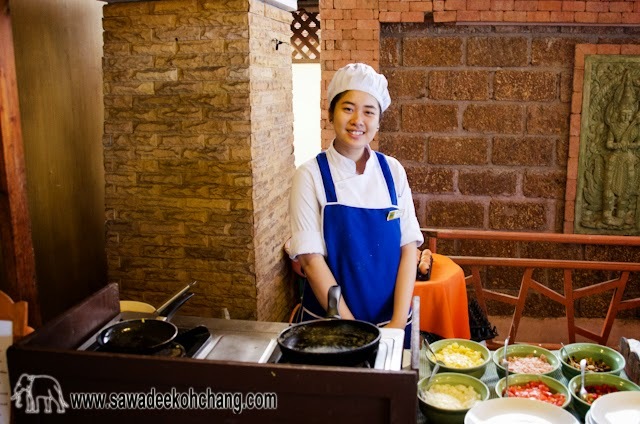 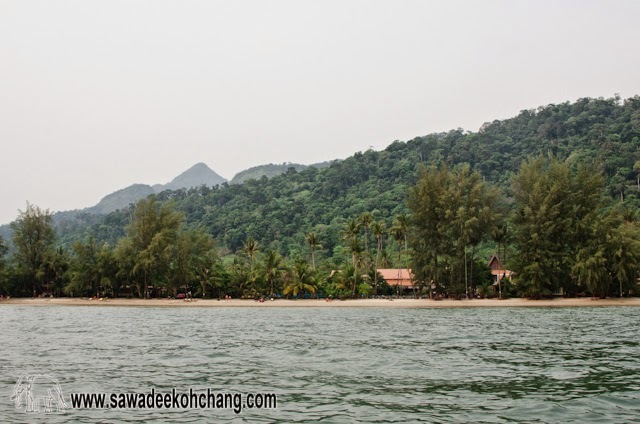 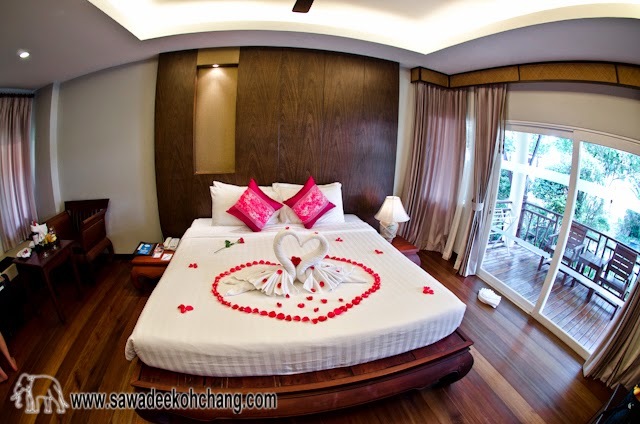 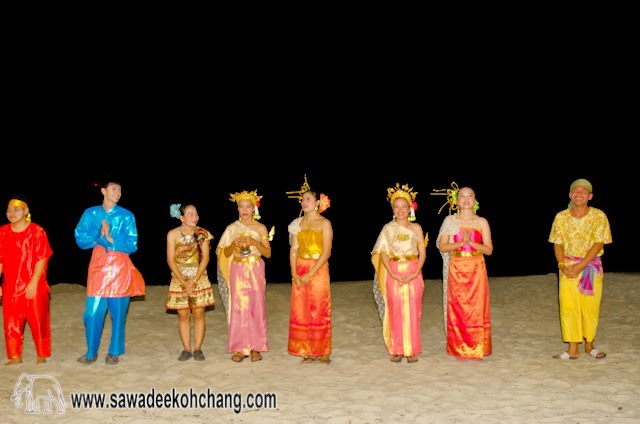 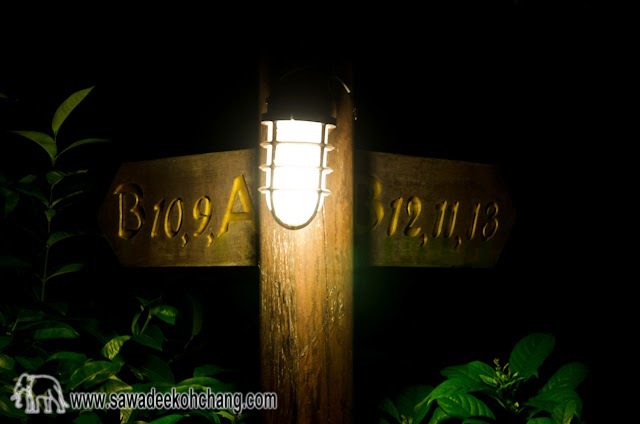 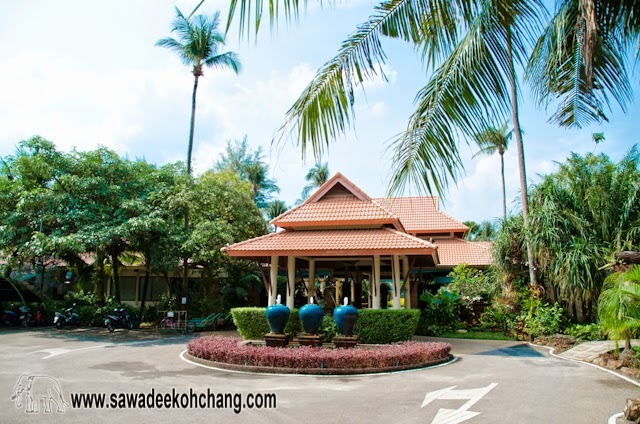 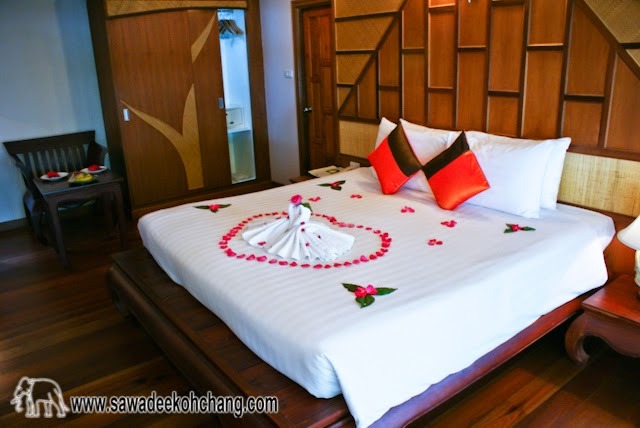 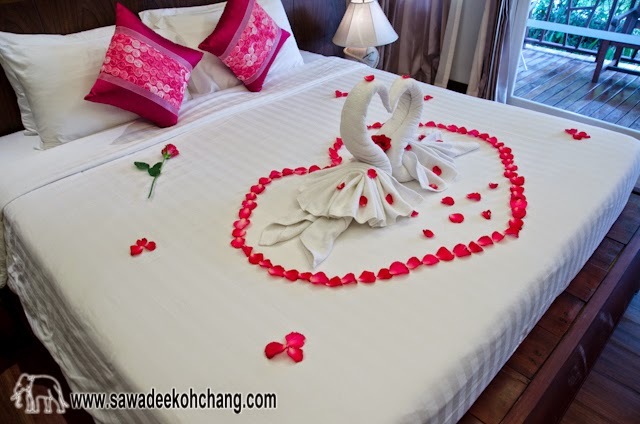 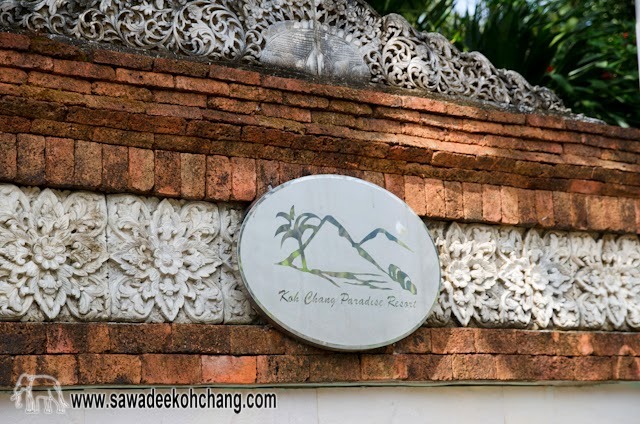 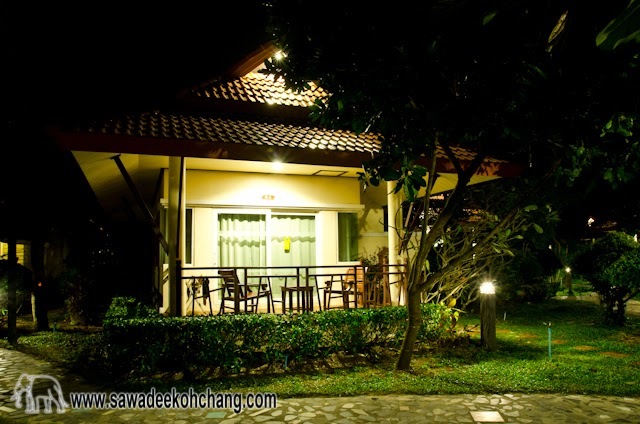 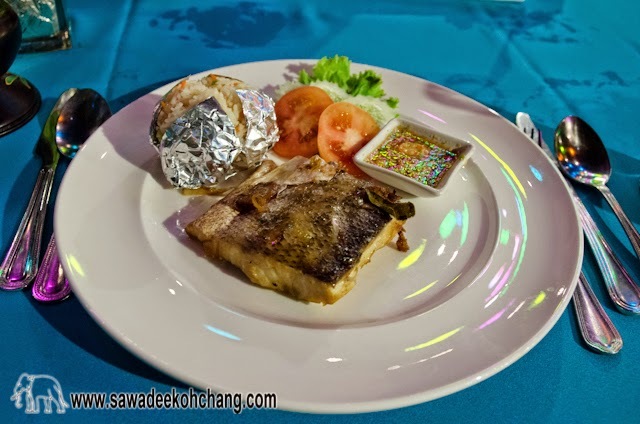 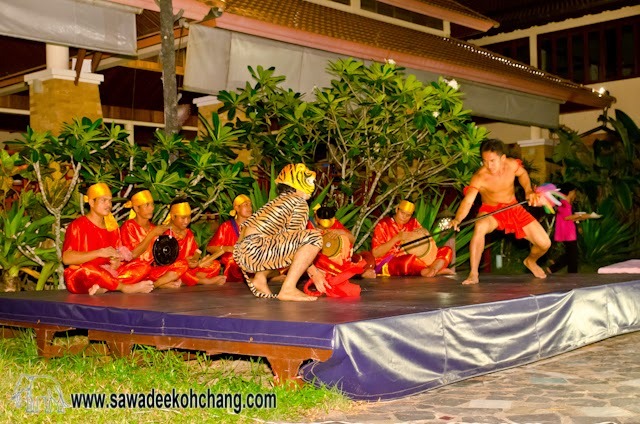 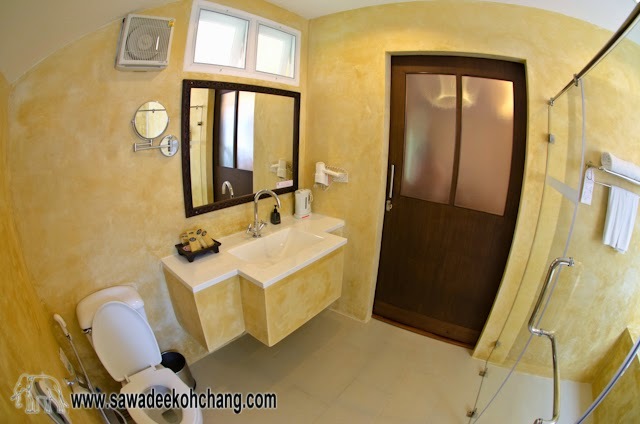 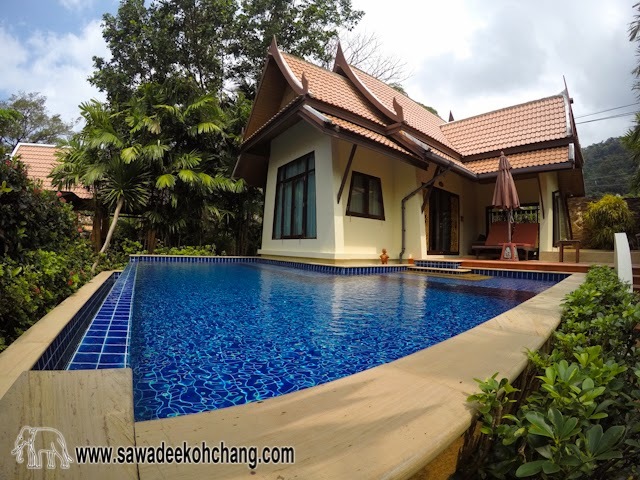 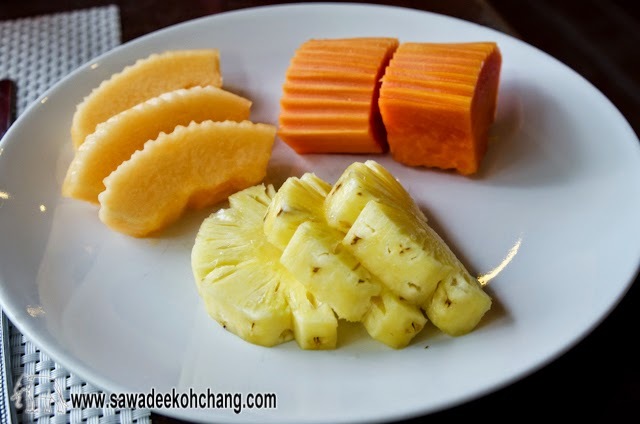 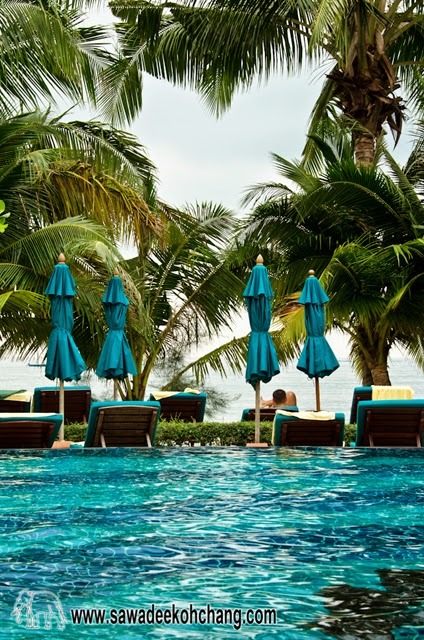 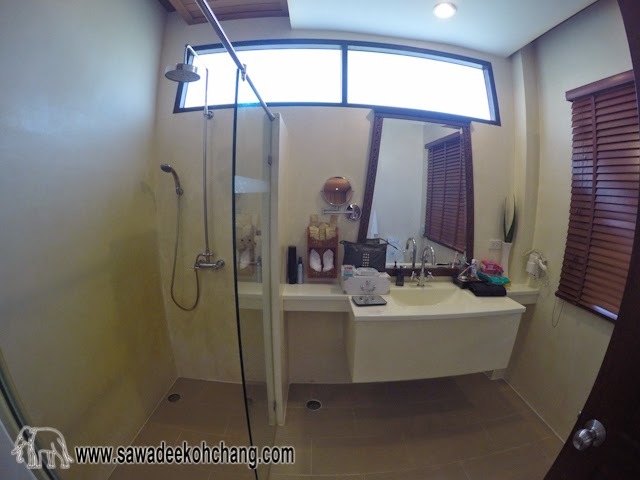 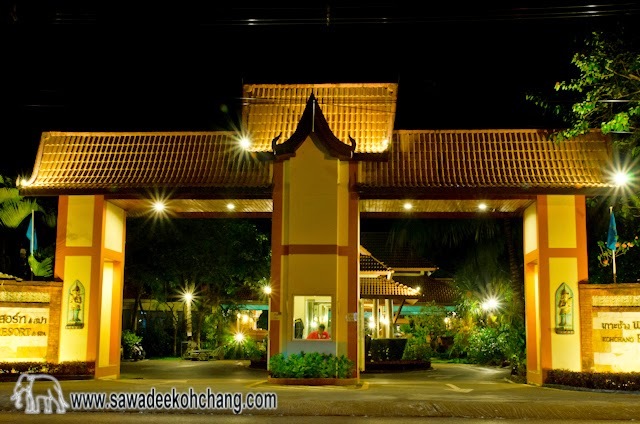 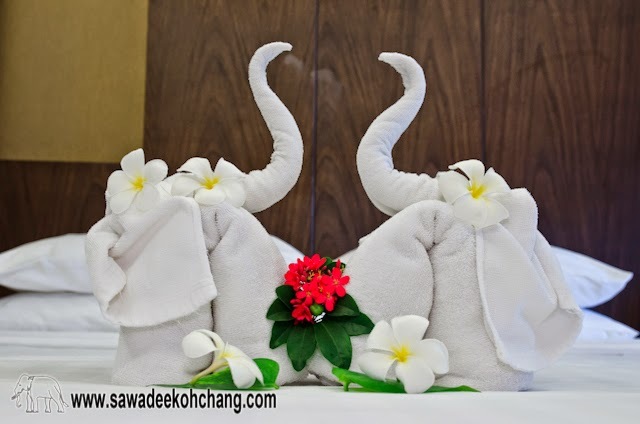 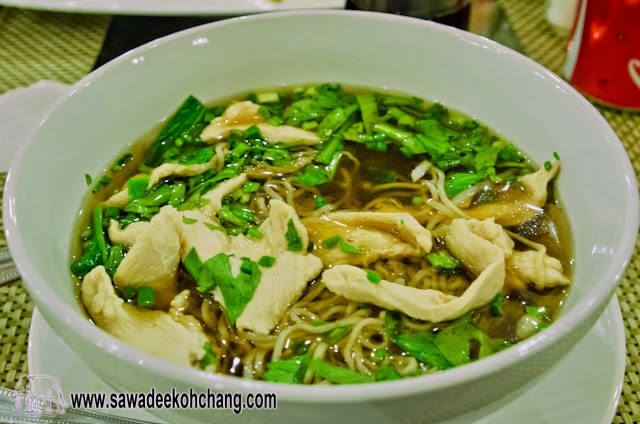 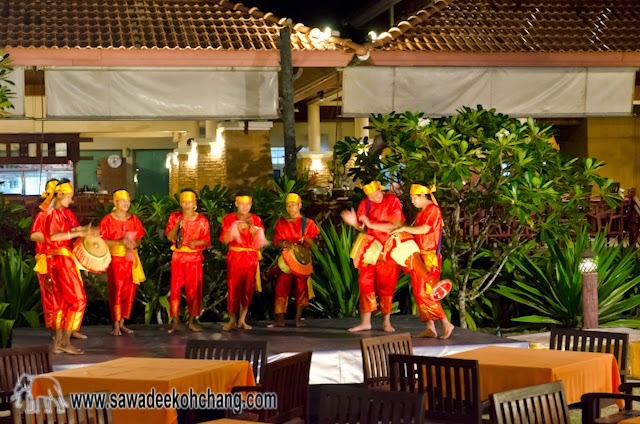 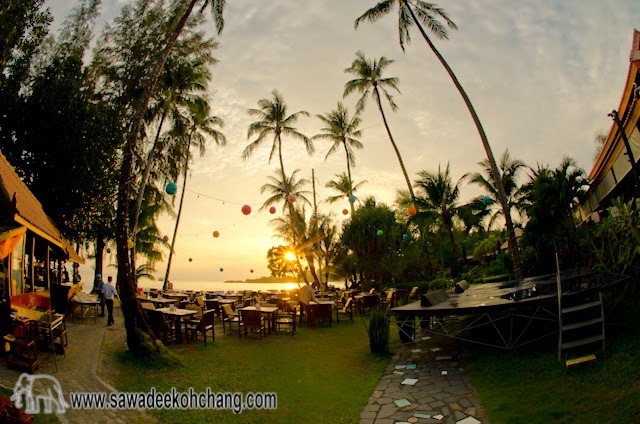 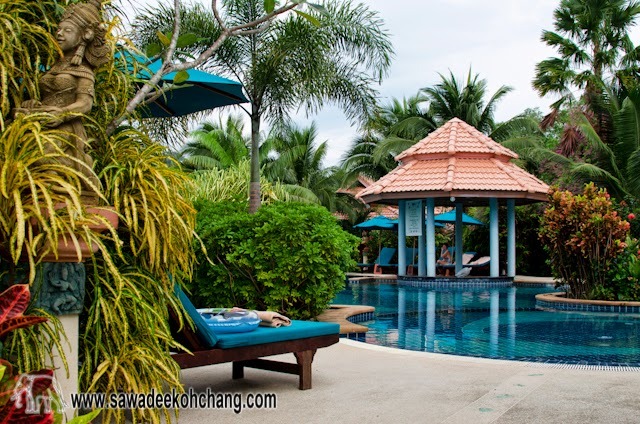 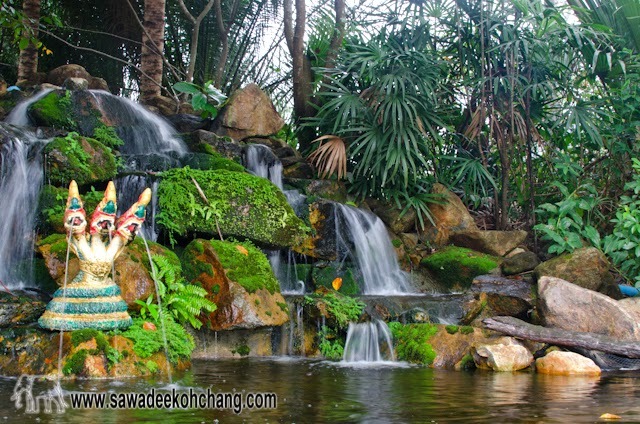 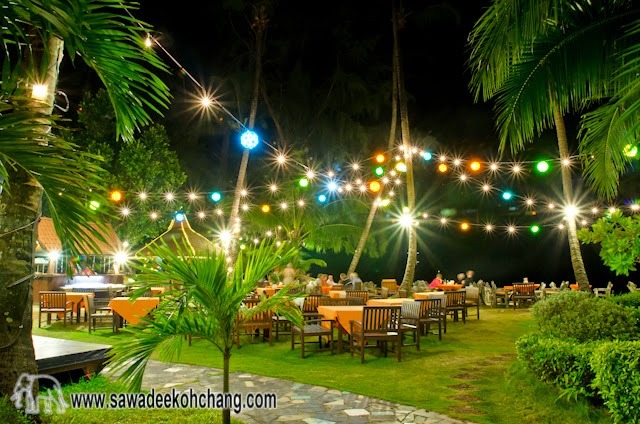 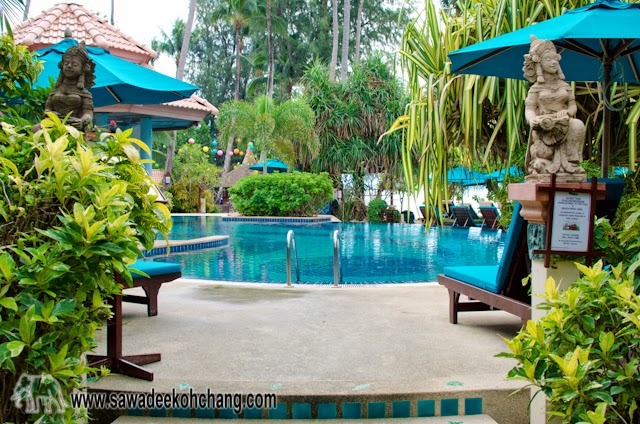 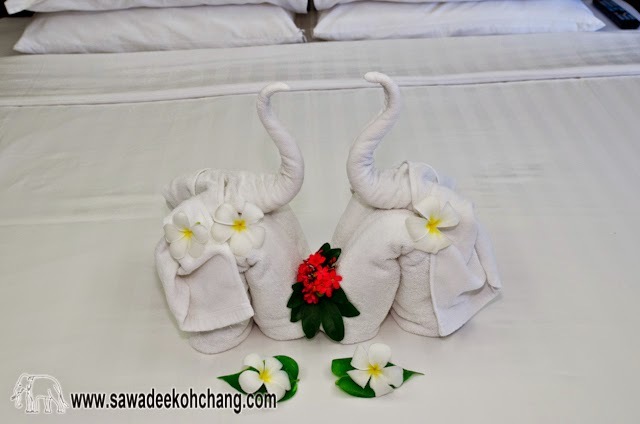 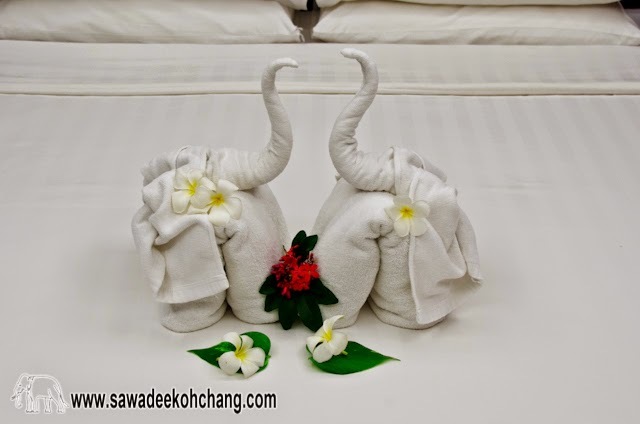 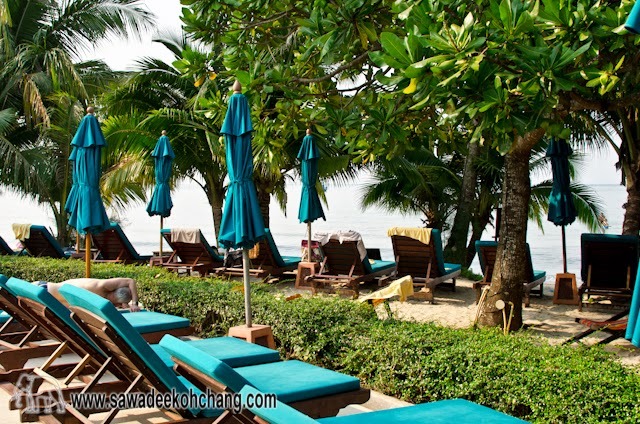 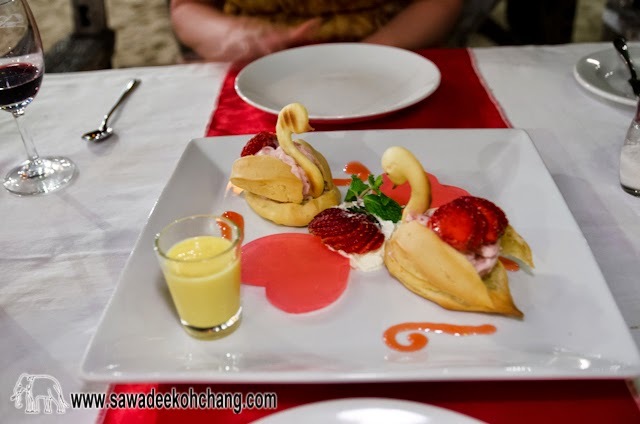 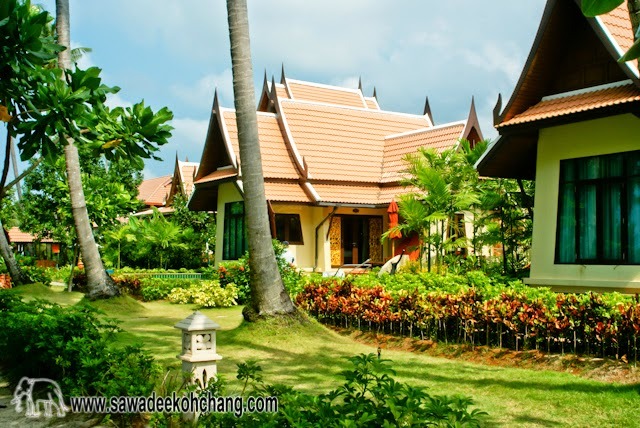 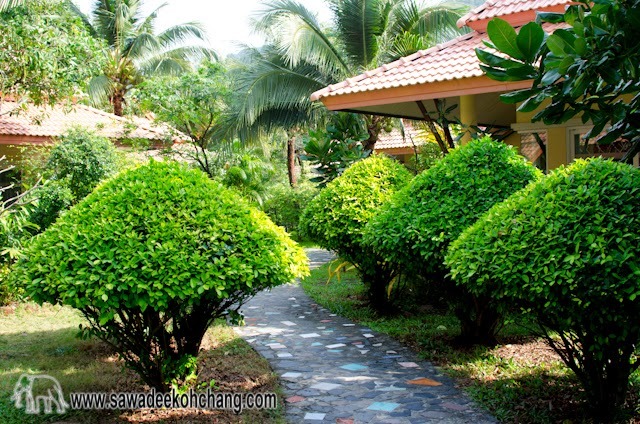 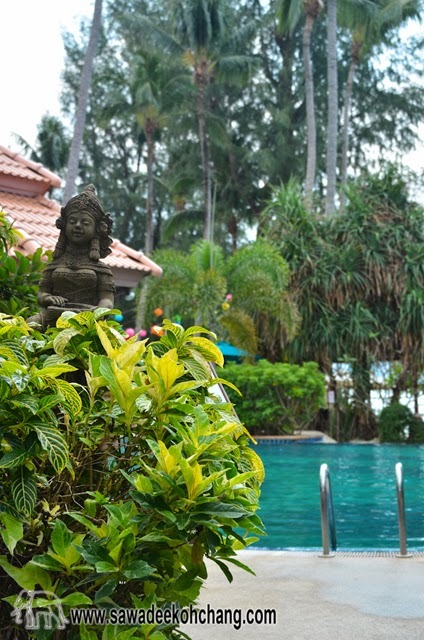 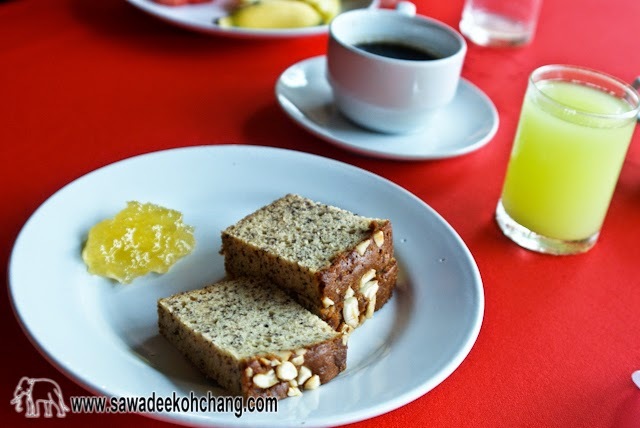 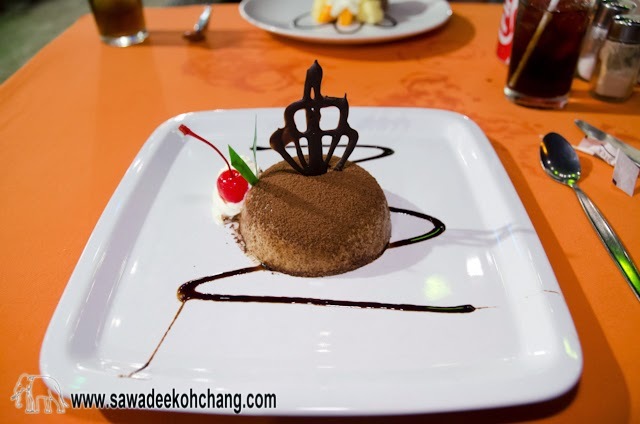 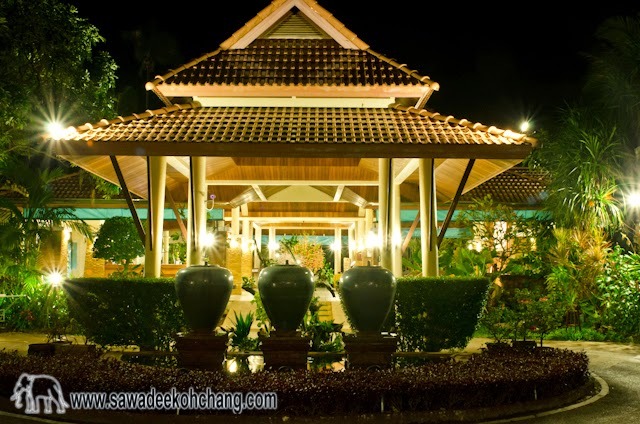 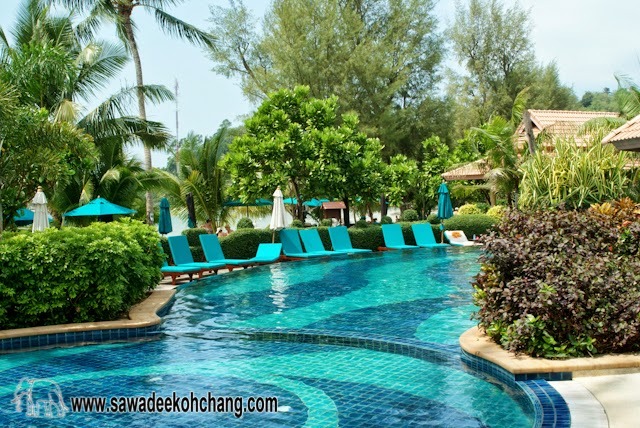 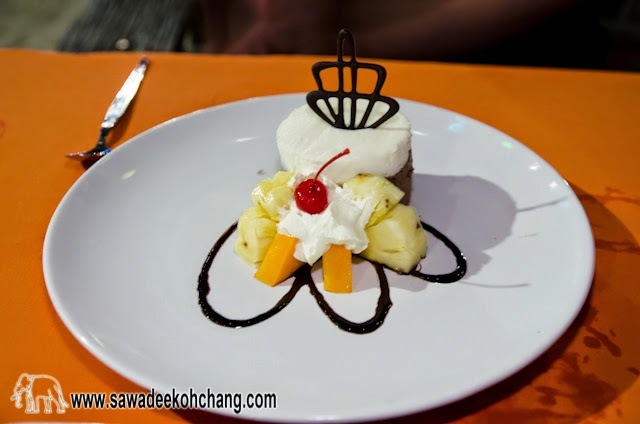 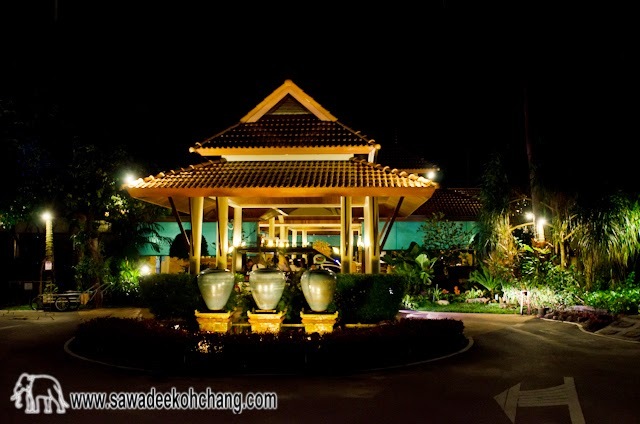 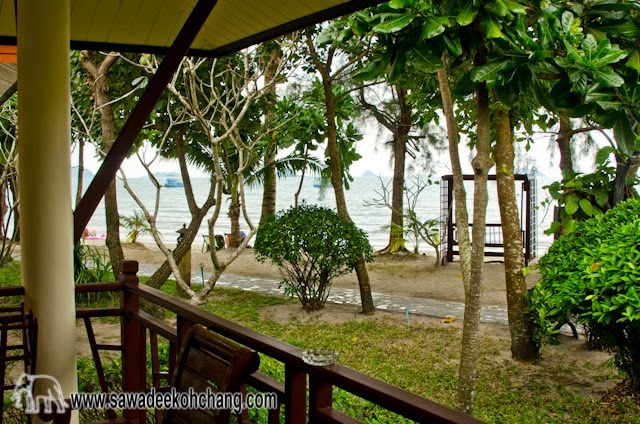 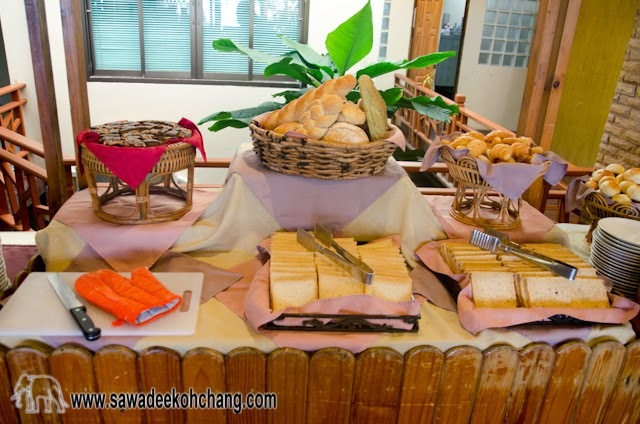 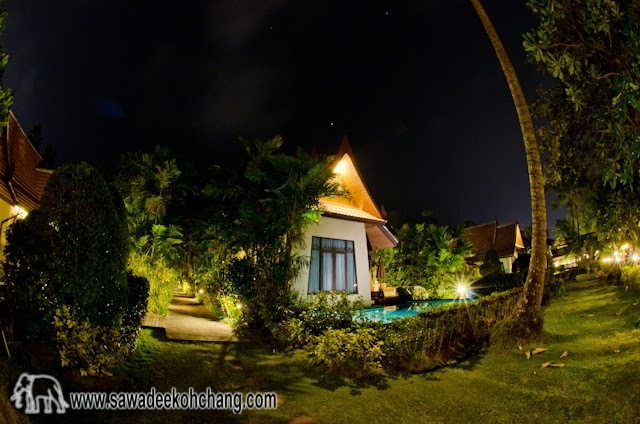 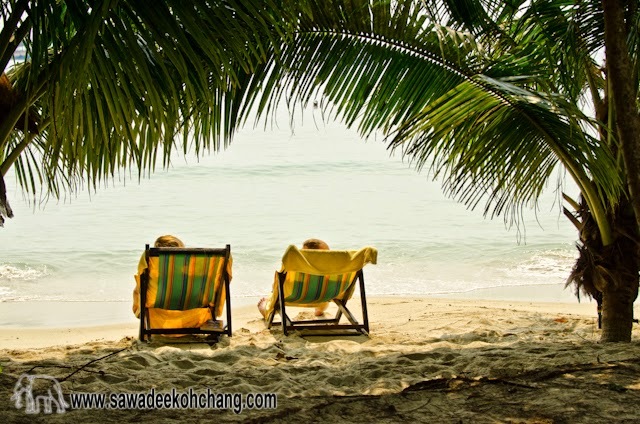 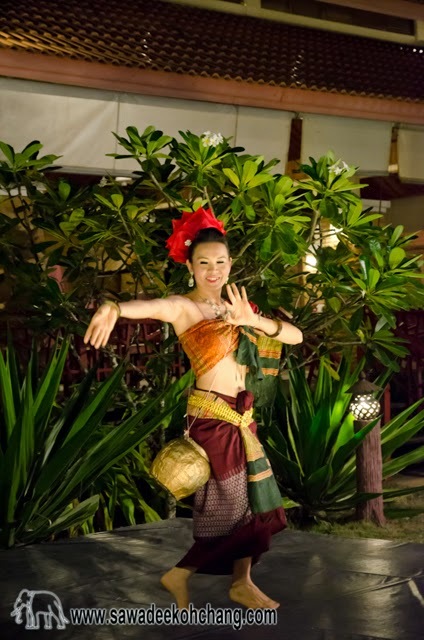 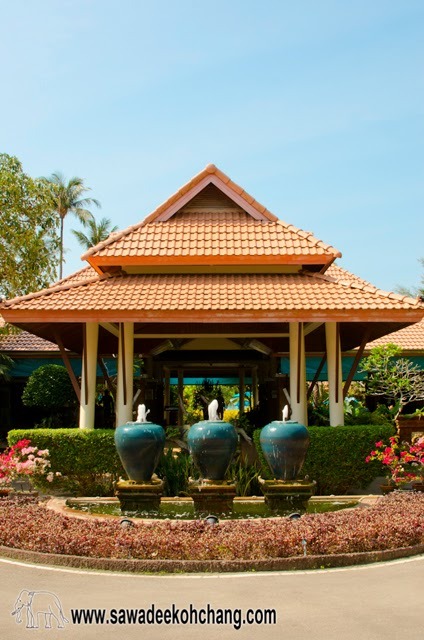 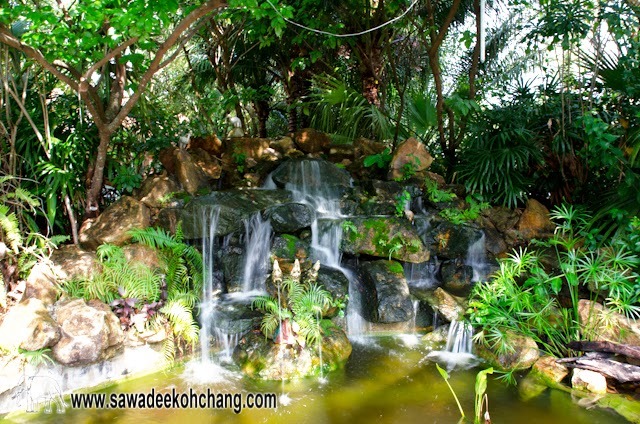 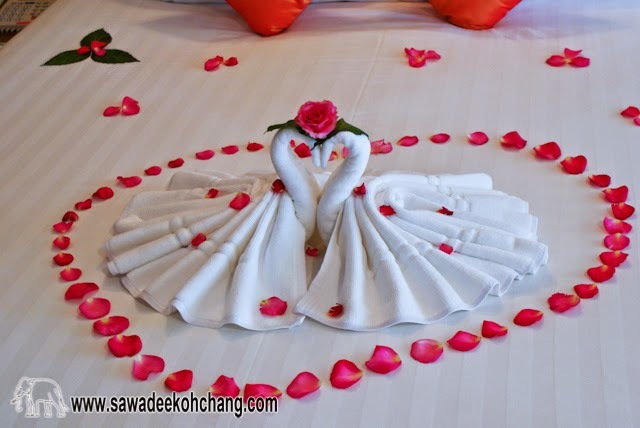 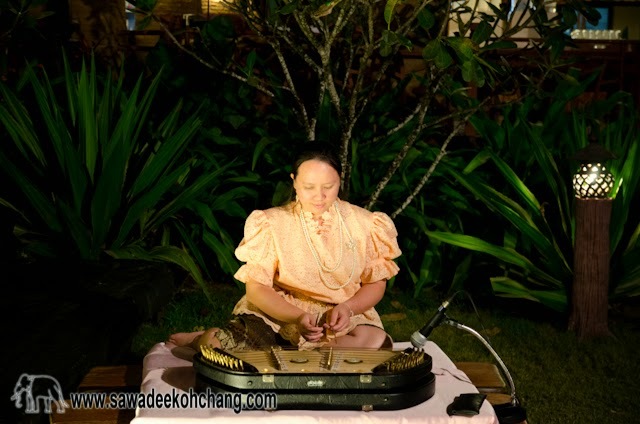 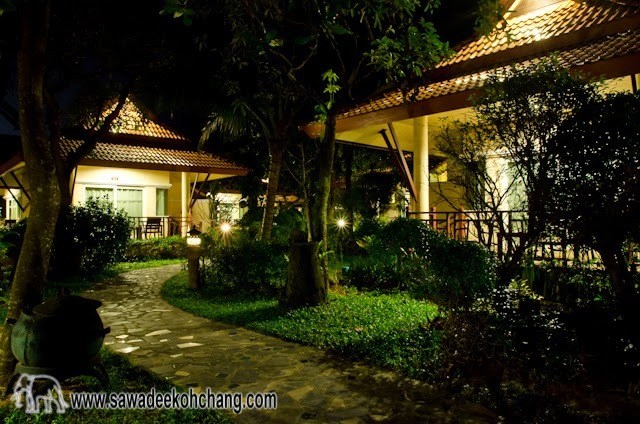 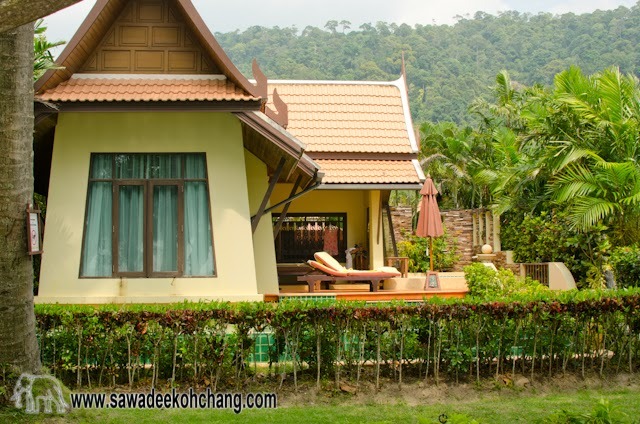 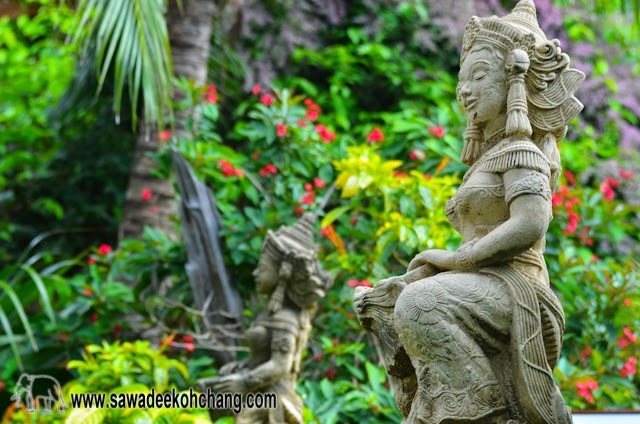 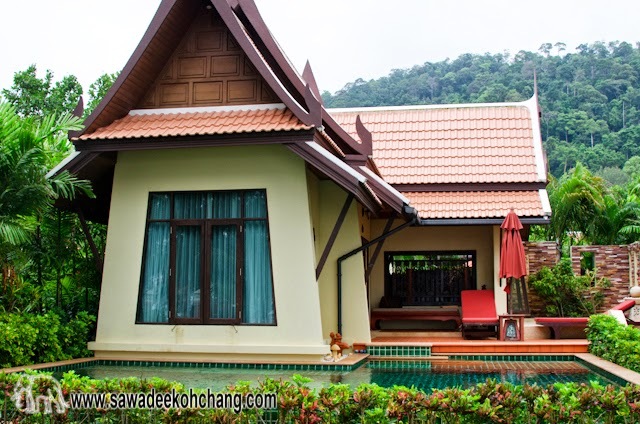 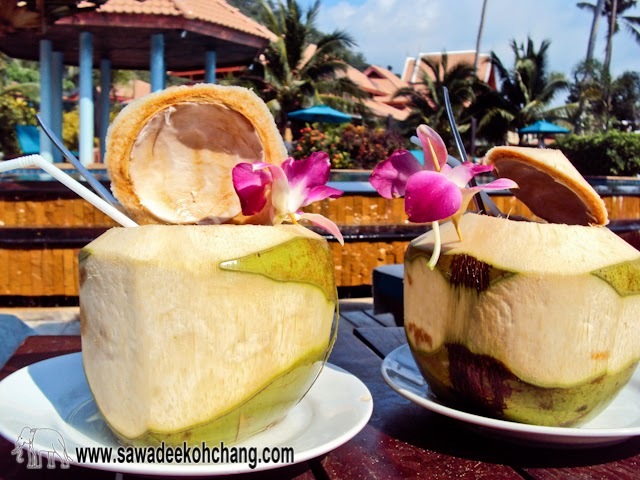 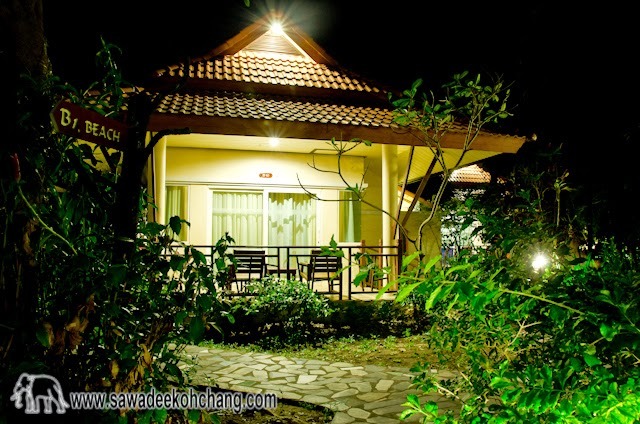 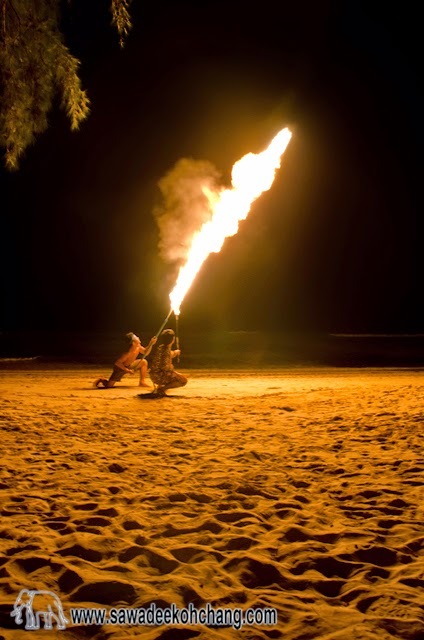 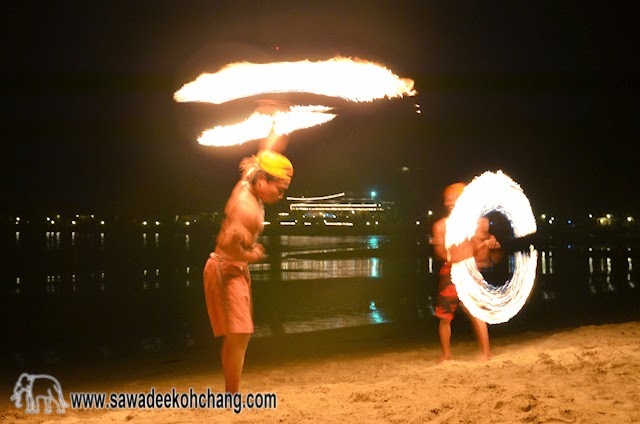 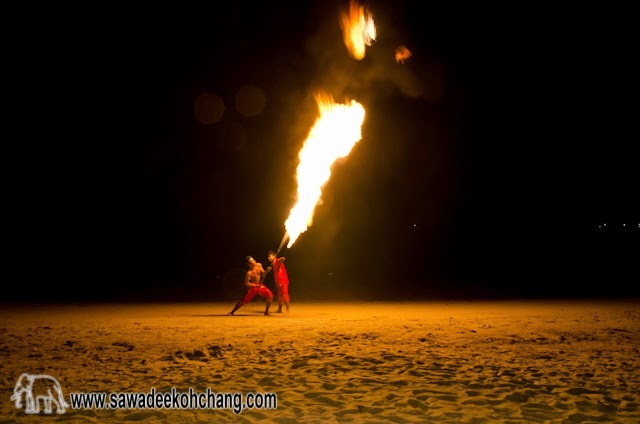 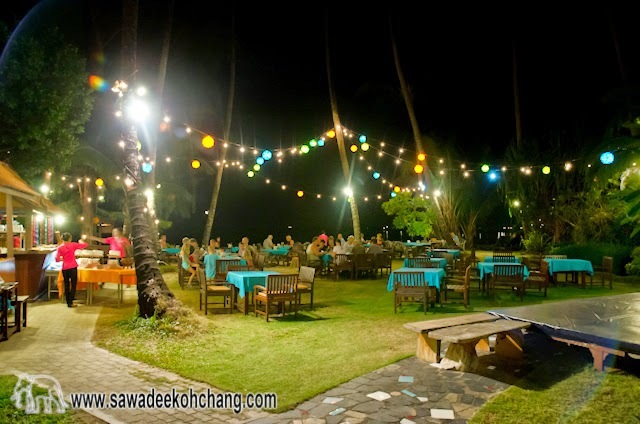 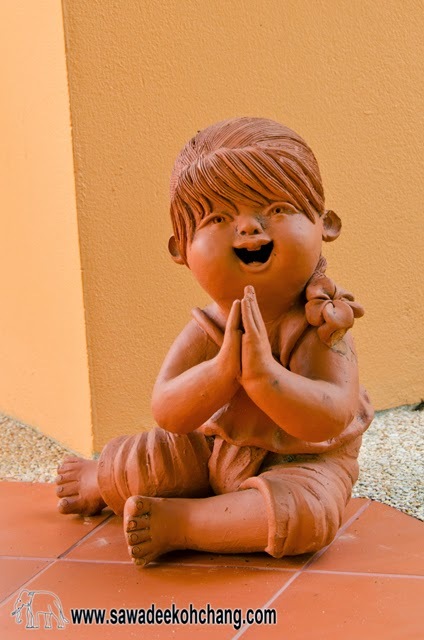 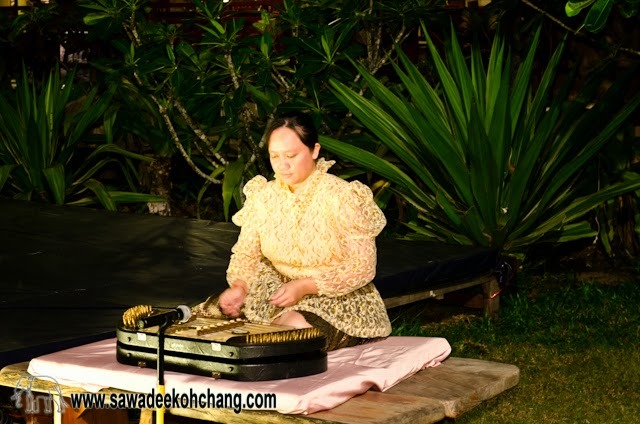 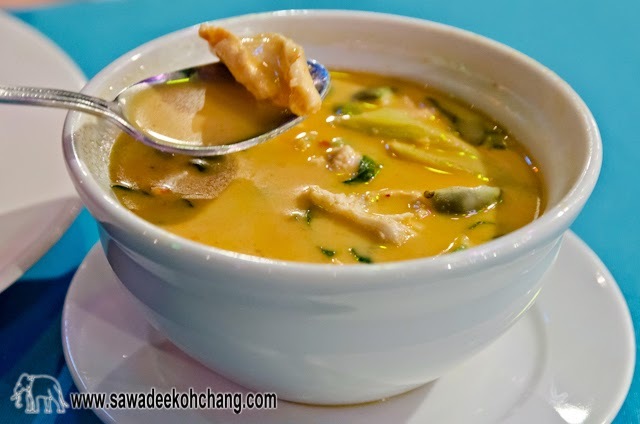 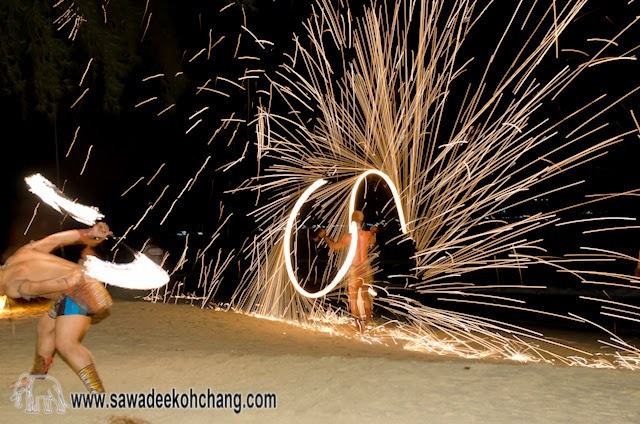 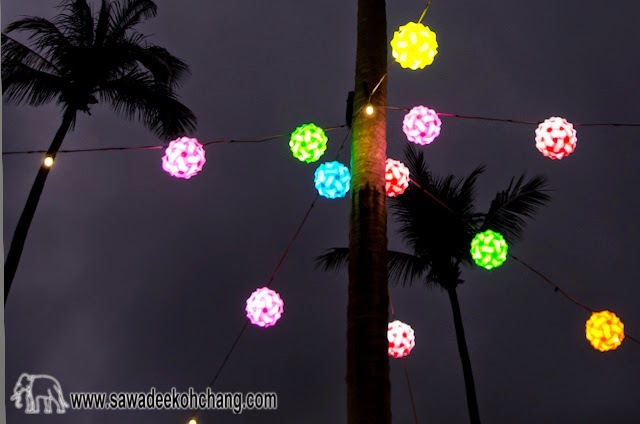 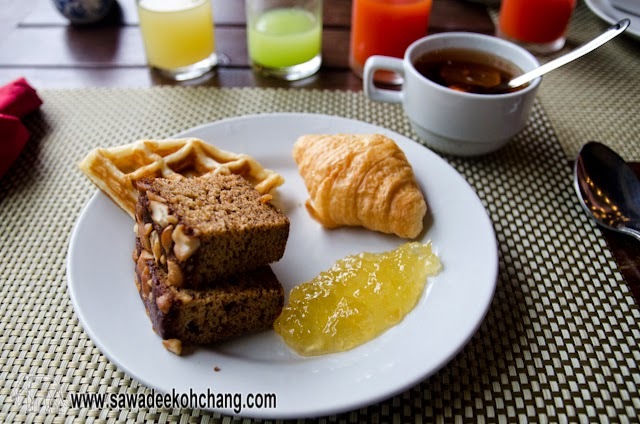 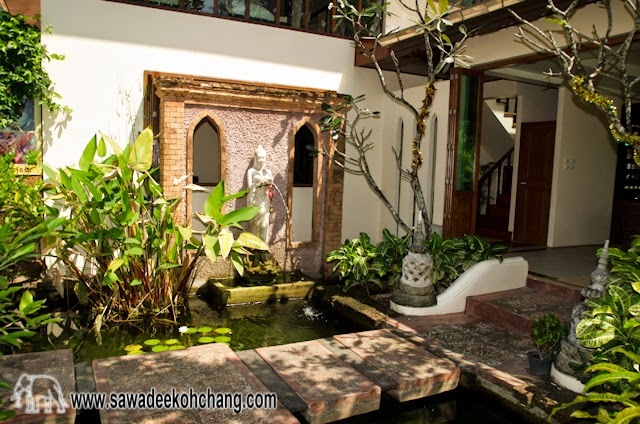 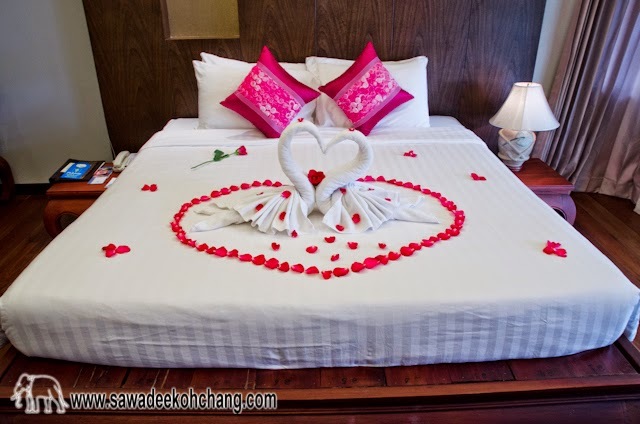 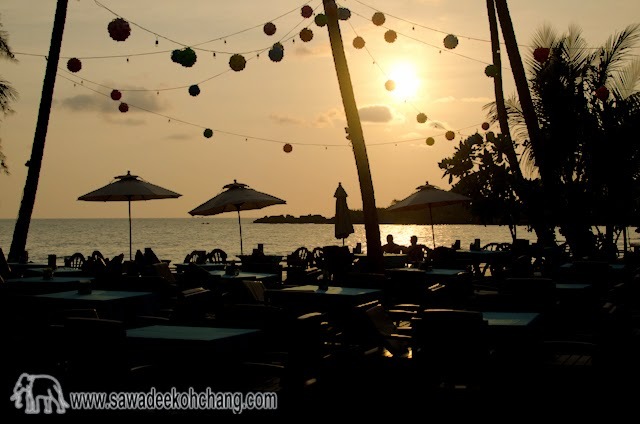 For me, Koh Chang Paradise Resort & Spa is one of the best resorts you can find in Koh Chang. 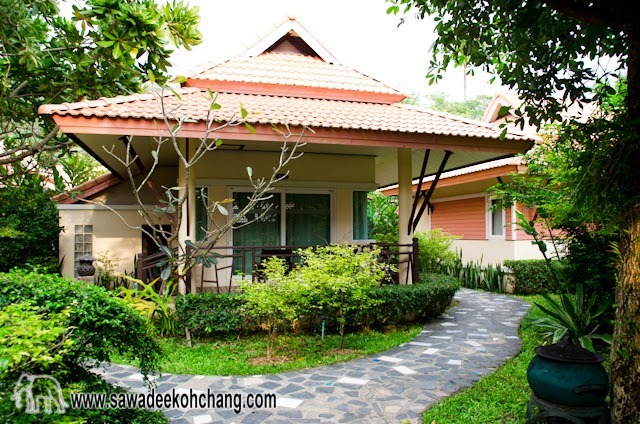 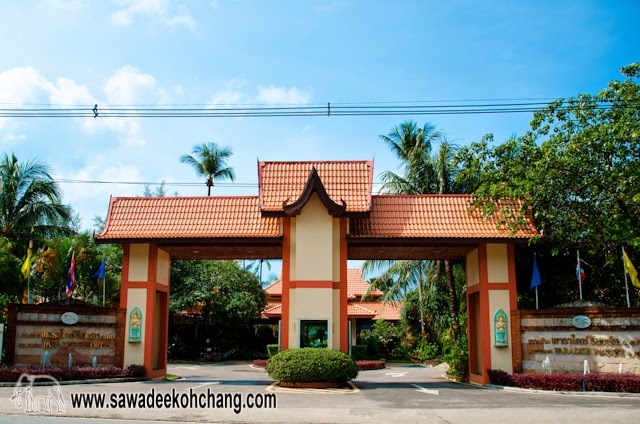 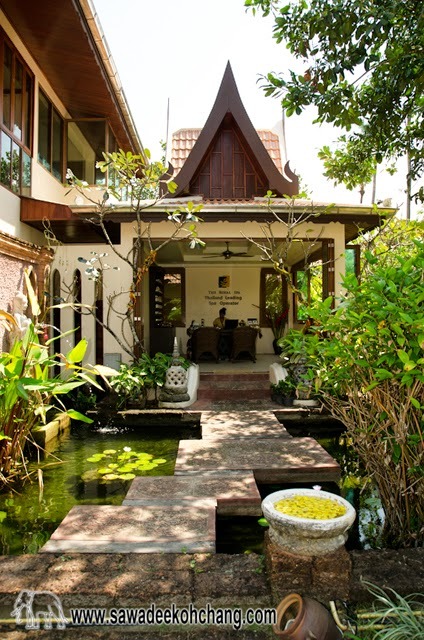 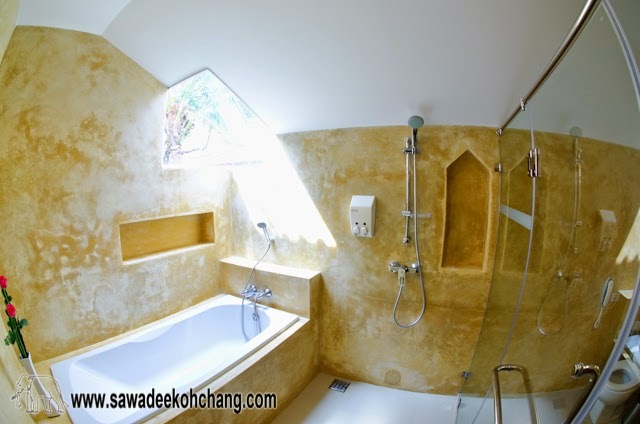 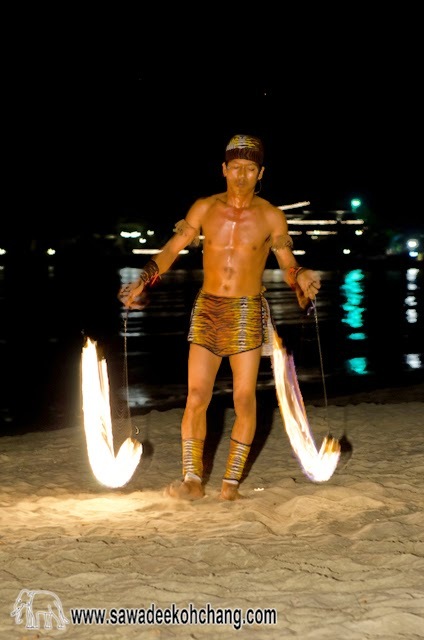 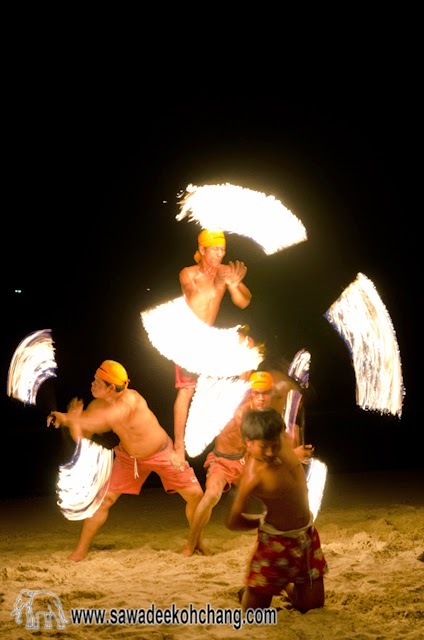 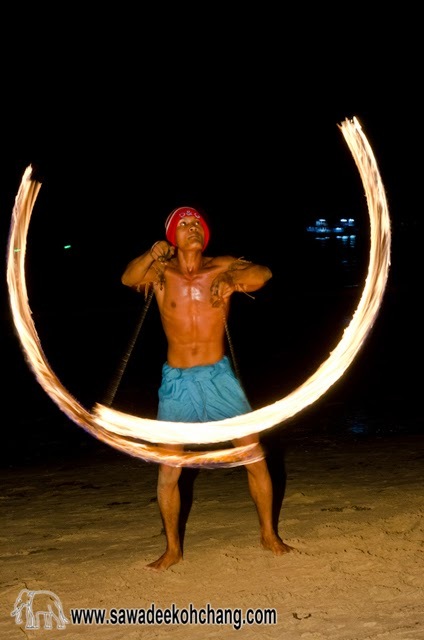 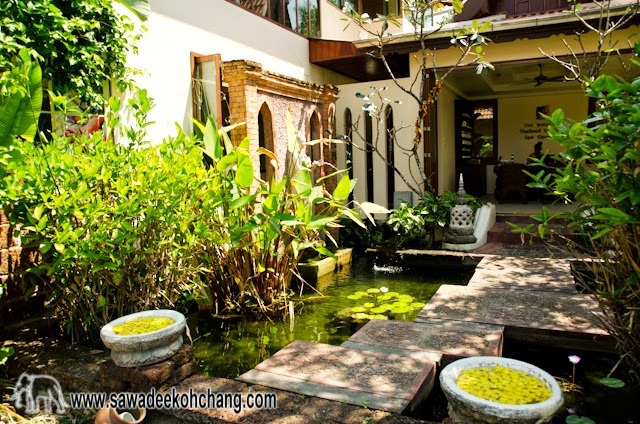 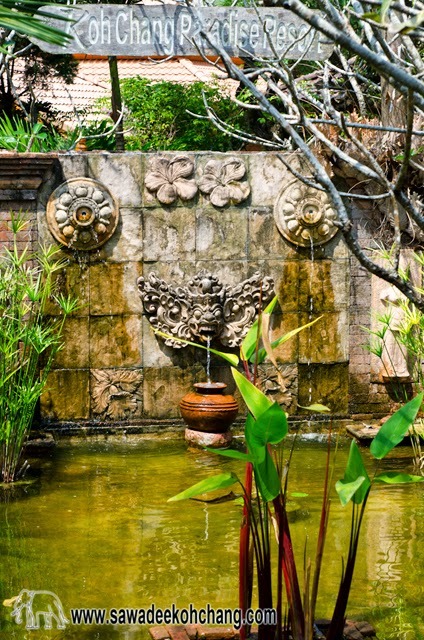 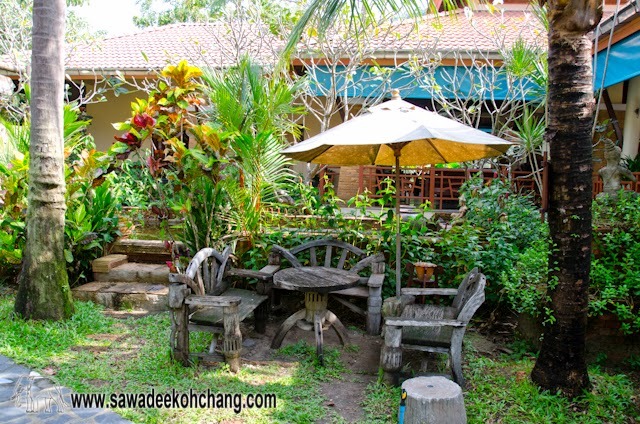 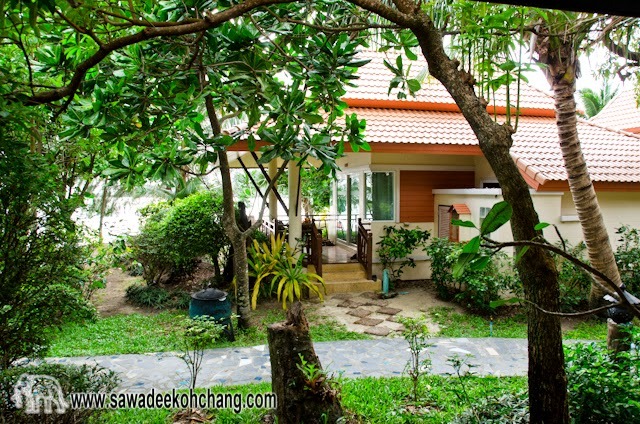 This 4-star Resort is located at the south of Chai Chet village, and directly on the north part of Klong Prao beach. 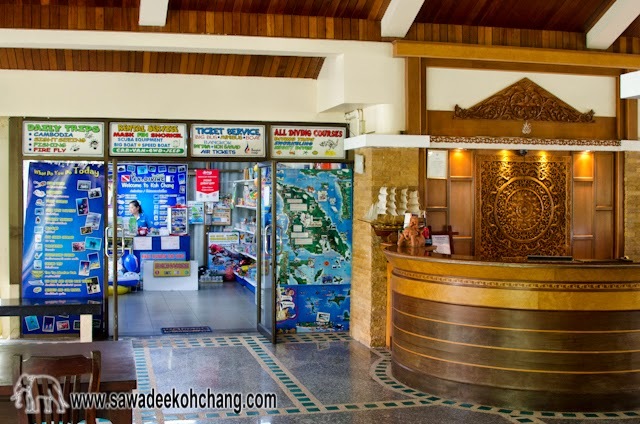 At about 2 minutes walk from the resort you will find Chai Chet main village and Coconut Plaza with 3 supermarkets (Tesco Lotus, V-Mart and 7/11), drugstores, restaurants, pubs, coffee shops, souvenirs shops, cloth shops, a bank to change money, few ATMs, a hairdresser, tailors, massage rooms and other small businesses. 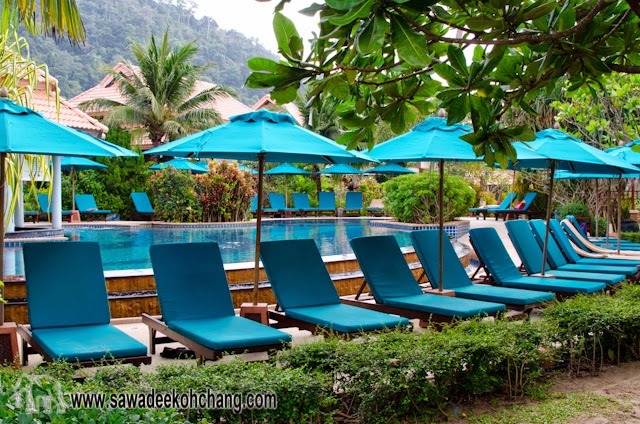 Koh Chang Paradise Resort & Spa is big enough without being crowded by their guests, quiet and pleasant to stay in. 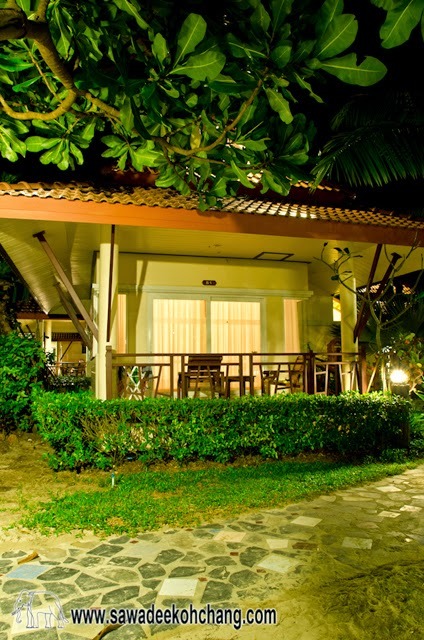 You have a direct access to the beach with a unique view on the sea, especially in the evening with beautiful sunsets. 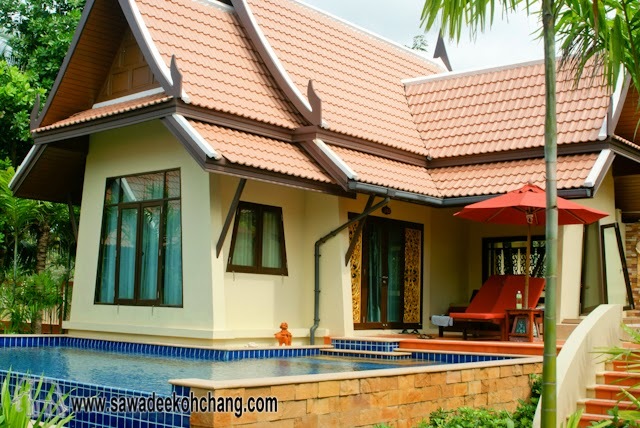 There are 69 Bungalows, 12 Pool Villas, an outdoor and indoor Spa, an indoor and outdoor restaurant, a swimming pool and a bar in an area of 17 acres and with 260 meters of beach front. 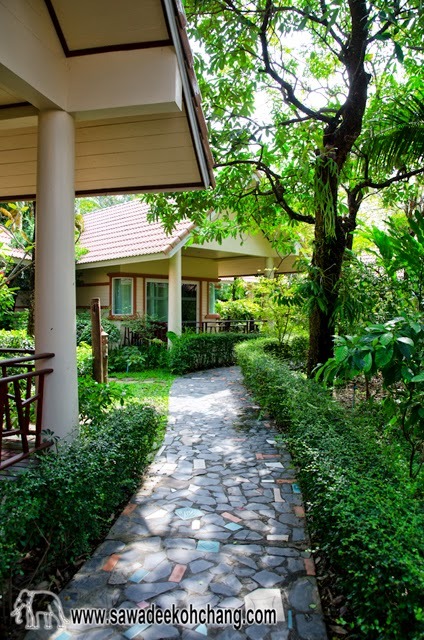 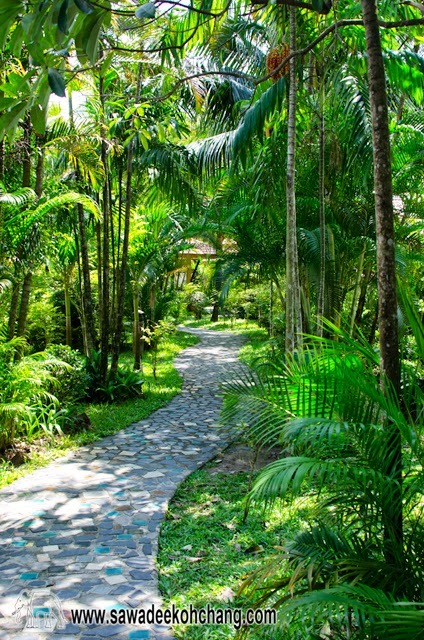 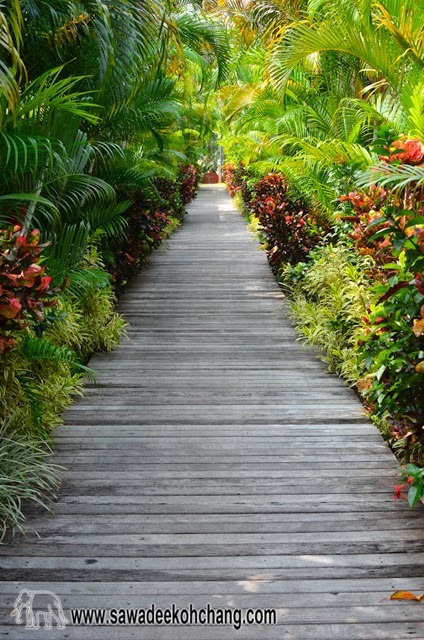 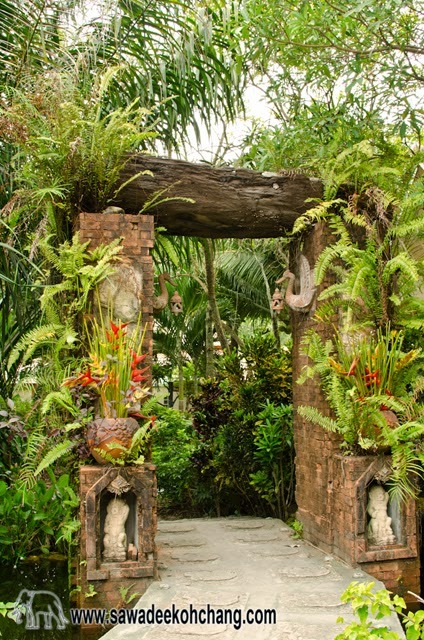 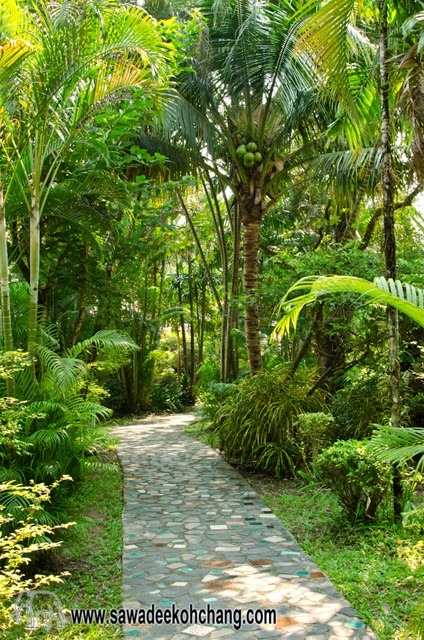 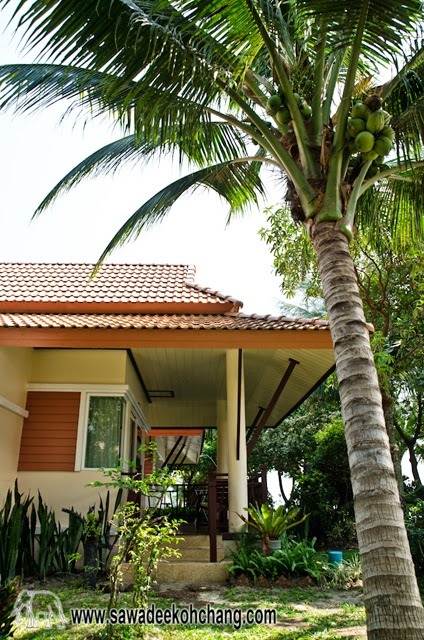 The bungalows are spread into a beautiful tropical garden with a lot of plants, trees and flowers that their gardeners are taking care daily. 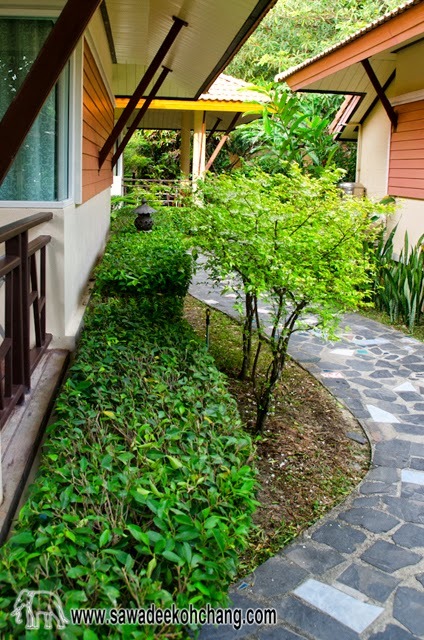 The cleanliness, quality and satisfaction of the customers is the priority of the Resort that's why it has been awarded by TripAdvisor for several years. 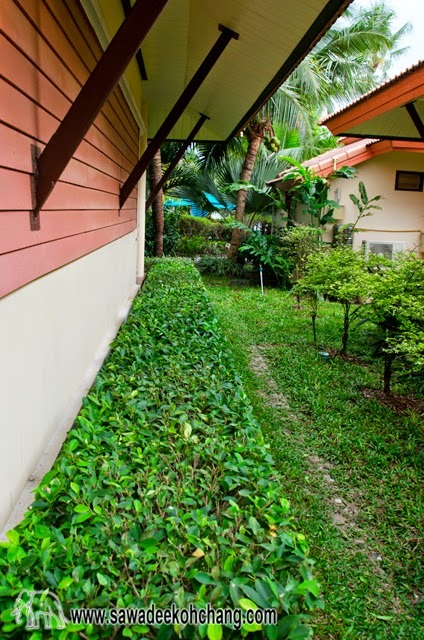 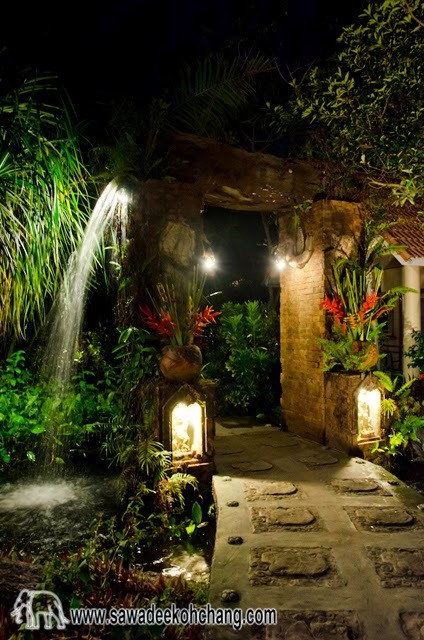 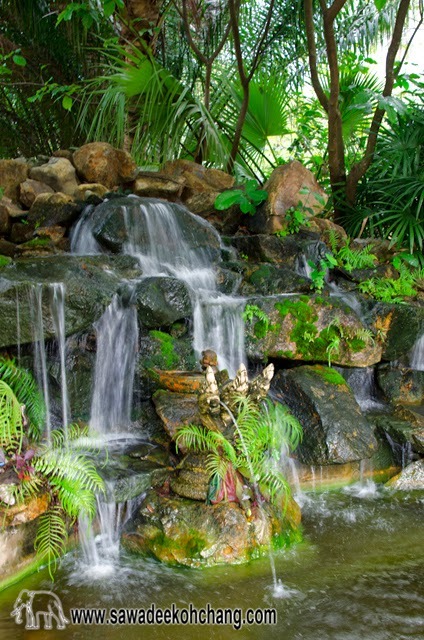 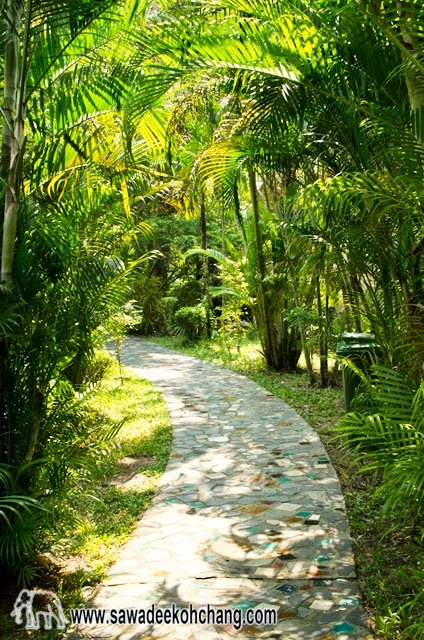 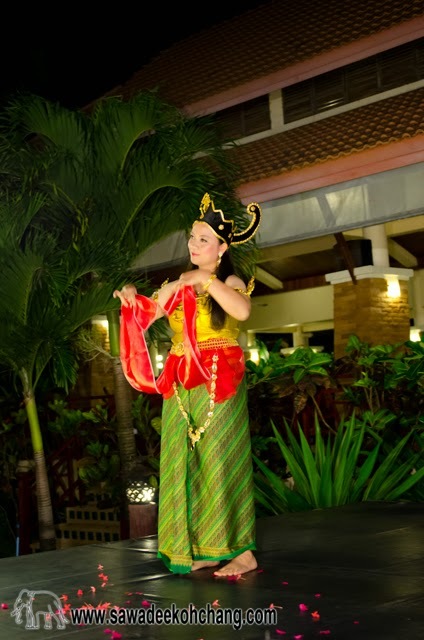 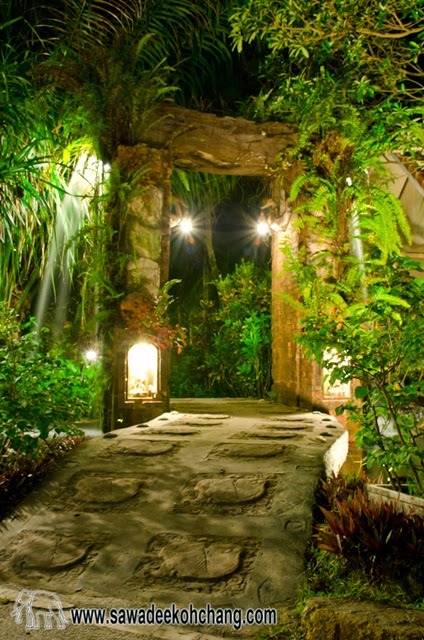 The Resort is also concerned by the environment protection and energy saving. 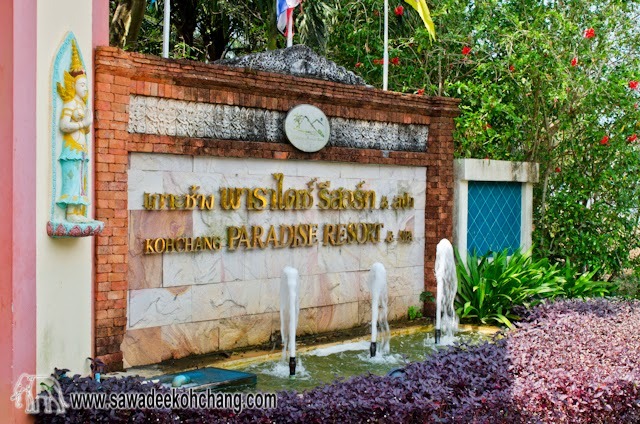 In 2009 Koh Chang Paradise Resort & Spa has been selected as the Excellent Green Resort from the Designated Areas for Sustainable Tourism Administration (Public Organisation) & Trat Province Government. 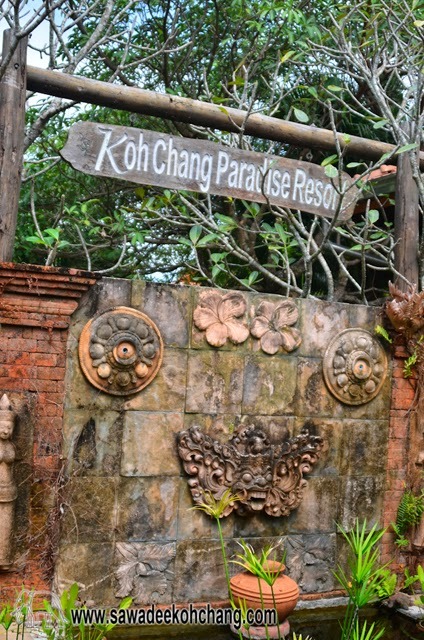 More pictures of the resort! 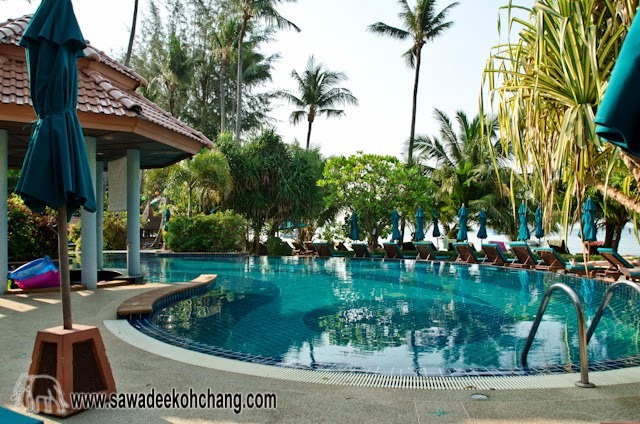 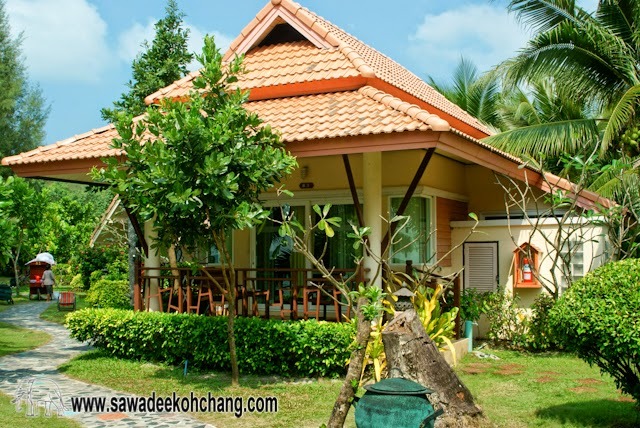 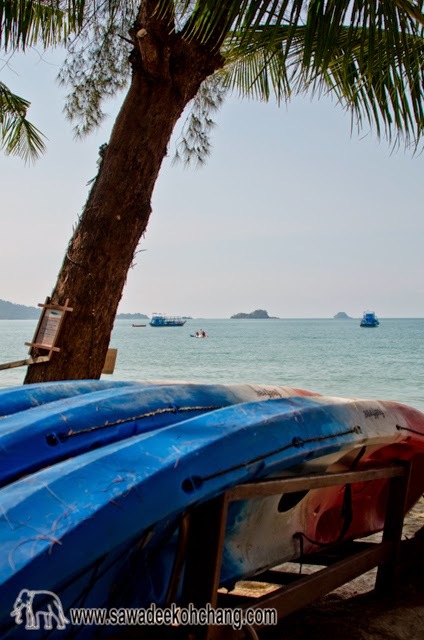 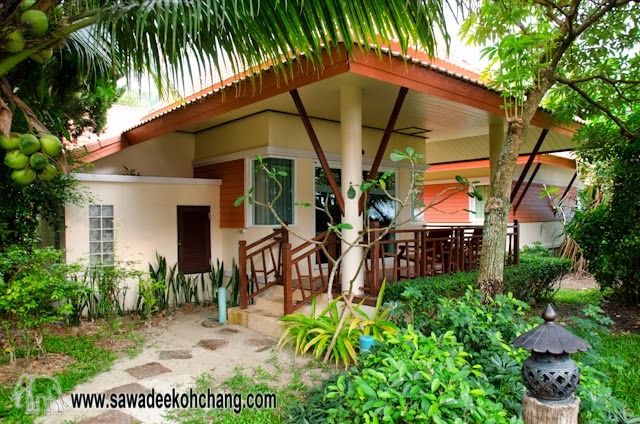 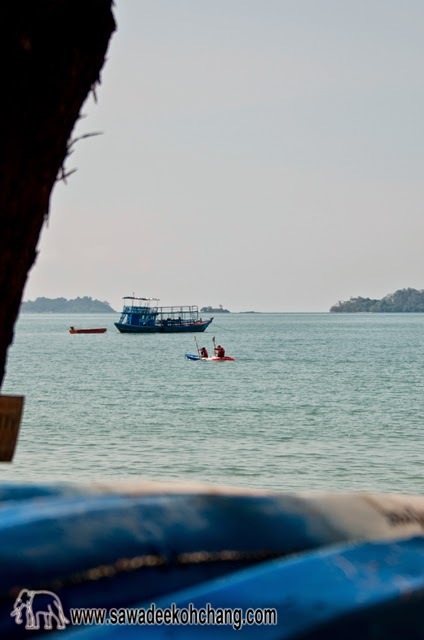 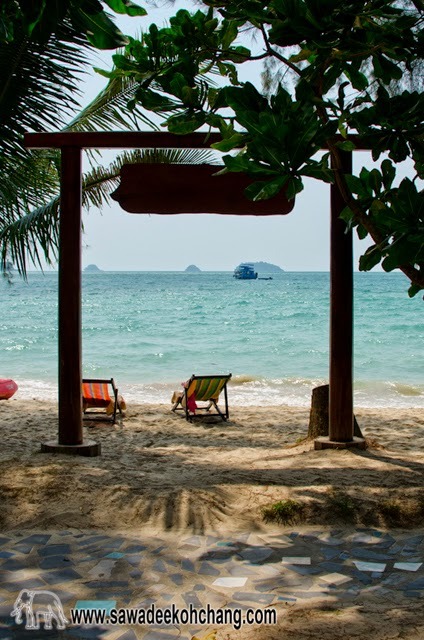 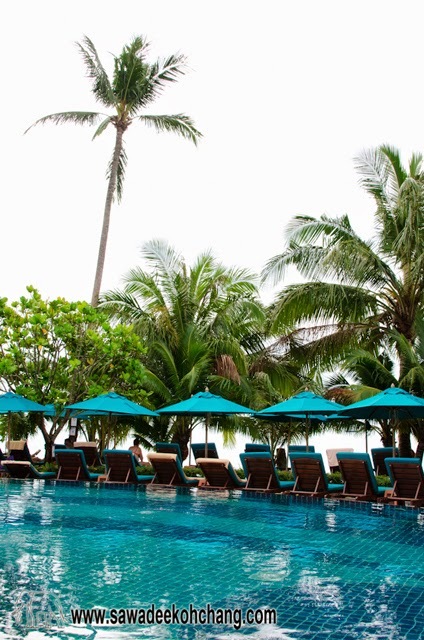 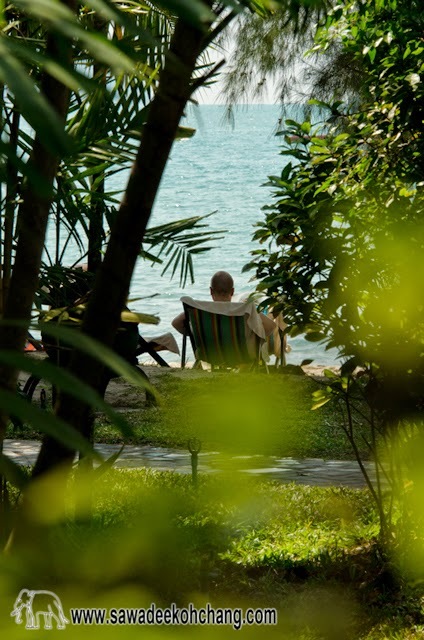 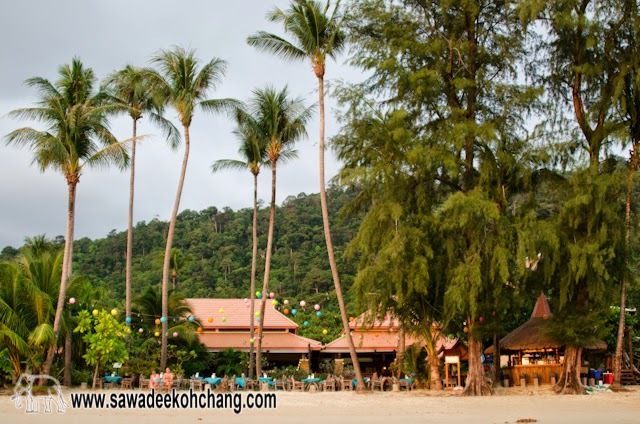 Koh Chang Paradise Resort & Spa has a direct access to the north part of Klong Prao beach. 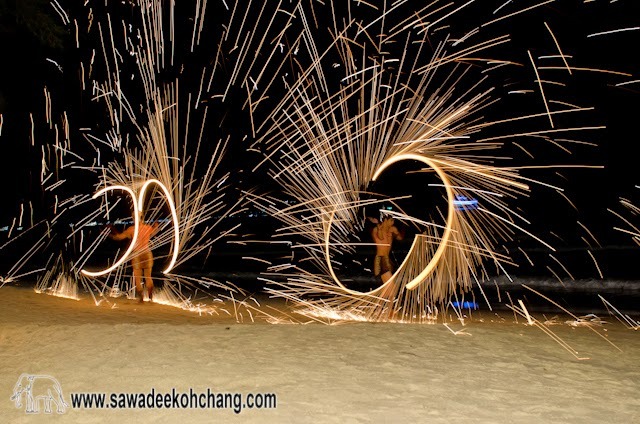 The 260 meters long beach front is covered with white sand which is cleaned every morning by the resort's employees. 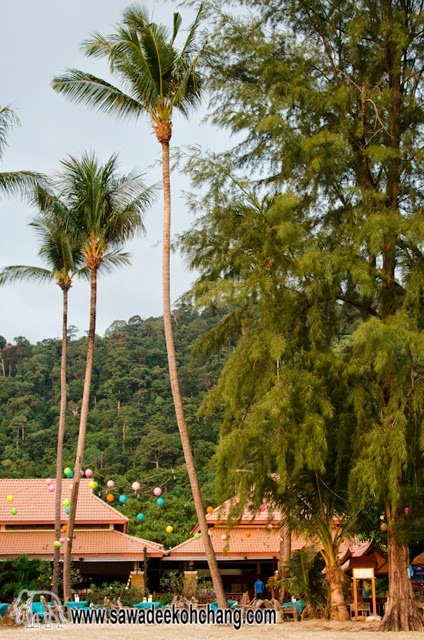 And there are no stones in the sea or on the beach in front of the resort. 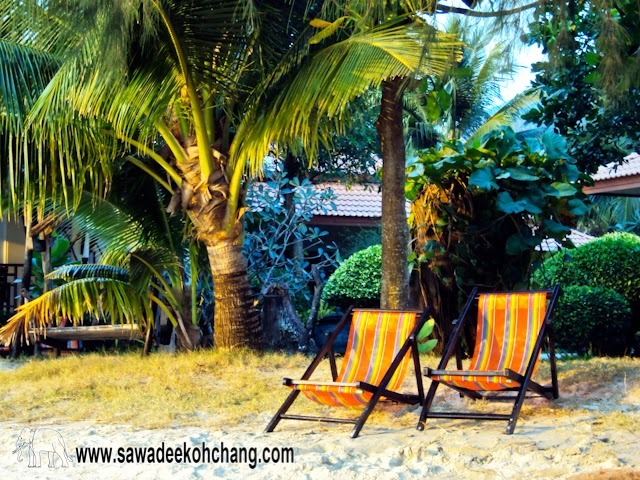 There are sun chairs on the beach available for the resort's guests. 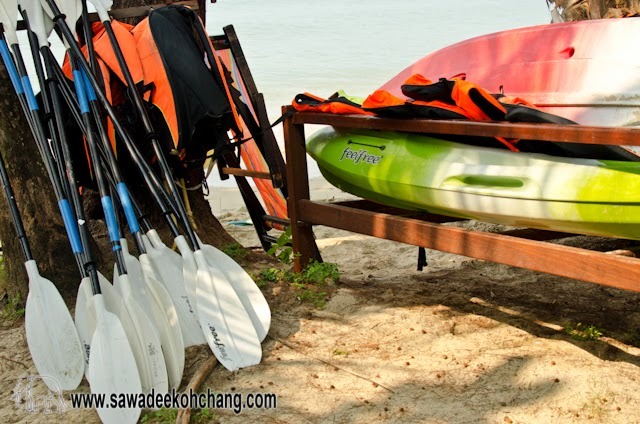 There are also few kayaks and safety jackets which can be rented at the reception. 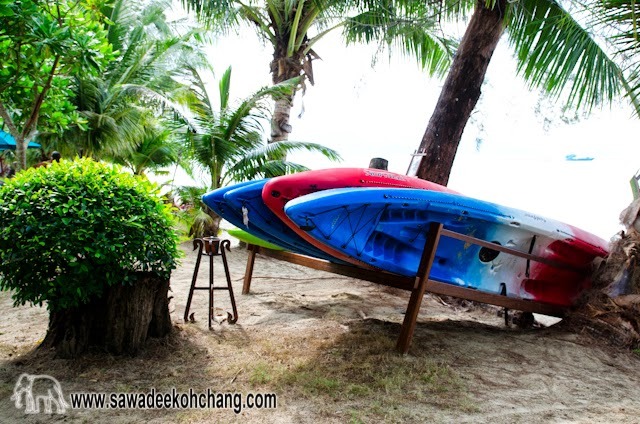 It takes about 15 minutes for one person to paddle from the resort to Klong Prao estuary river for example. 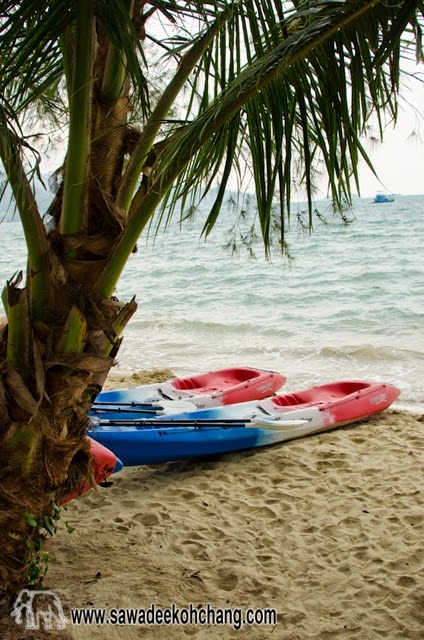 In an hour, 2 persons in a kayak can do a nice trip around. 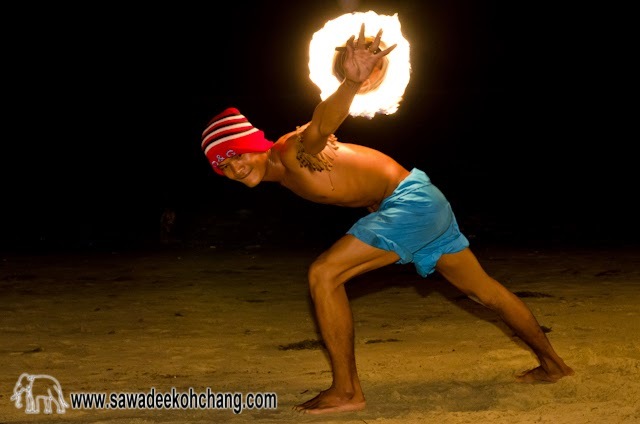 Don't forget to wear a t-shirt and a hat, the sun is very strong. 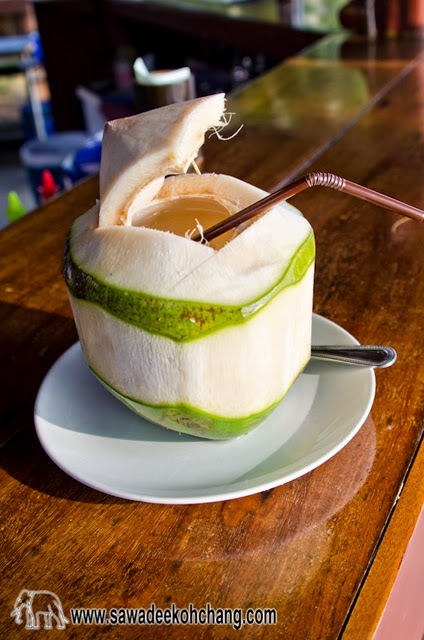 Take also a water bottle with you, you will enjoy it. 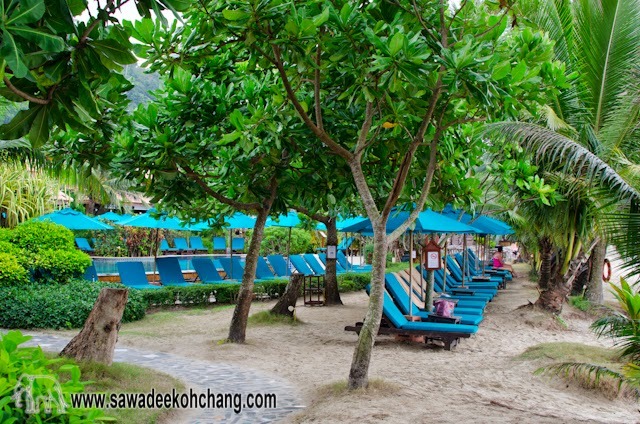 The resort has installed 2 swings in the trees directly on the beach. 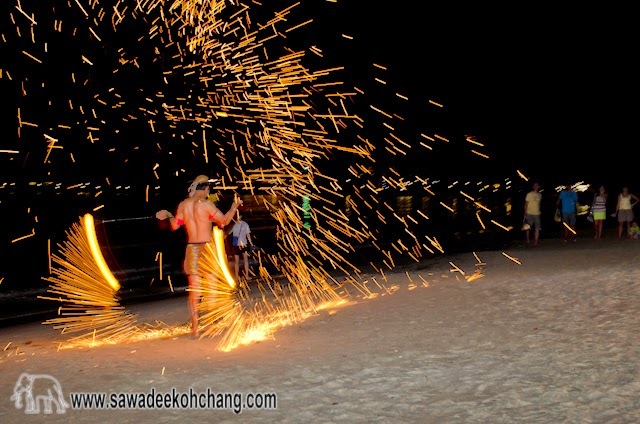 Young and older will have a lot of fun. 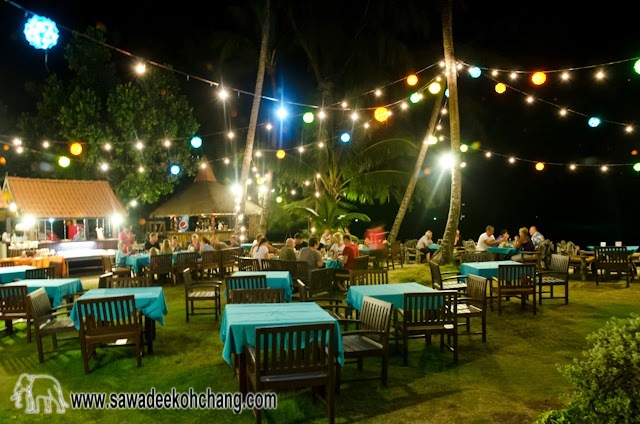 The outdoor restaurant of the resort is just in front of the beach as well as the bar. 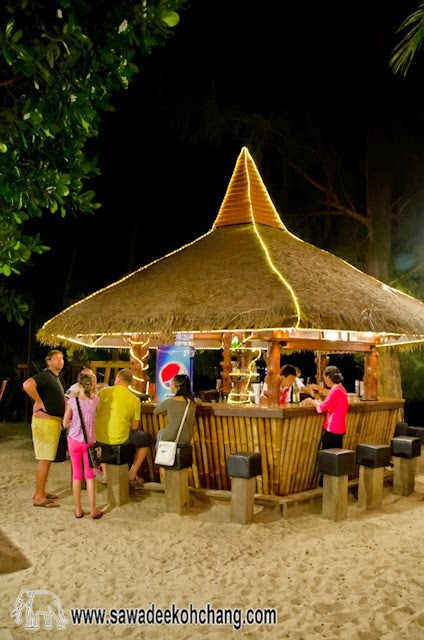 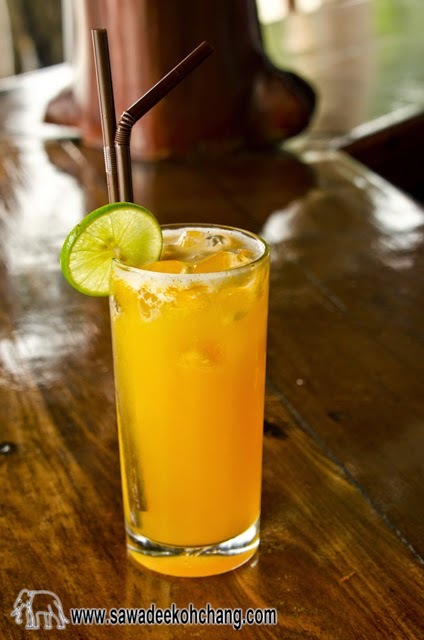 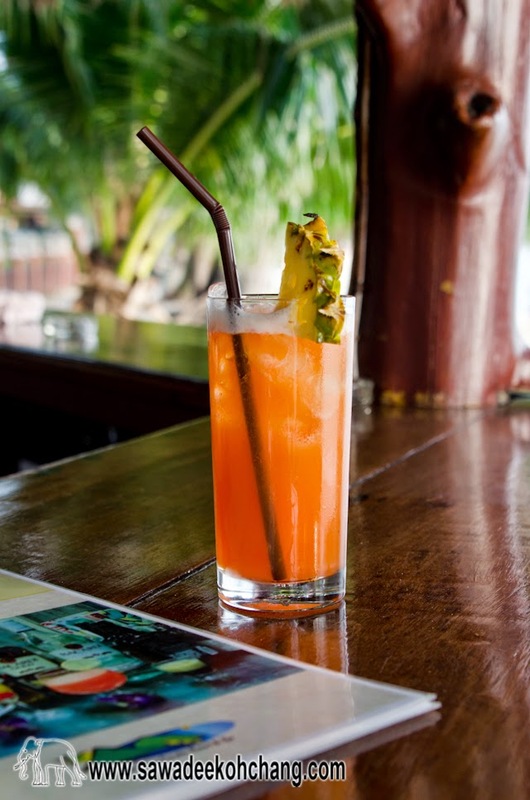 You can get any drink at the beach or ask to get them at the pool or in your bungalow for example. 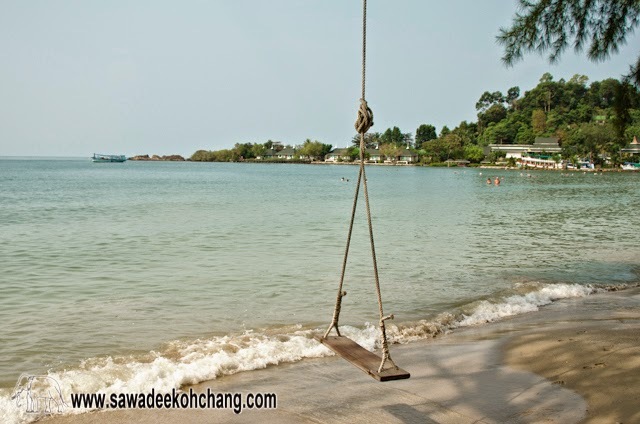 During the high season, the sea is very calm and the water clear. 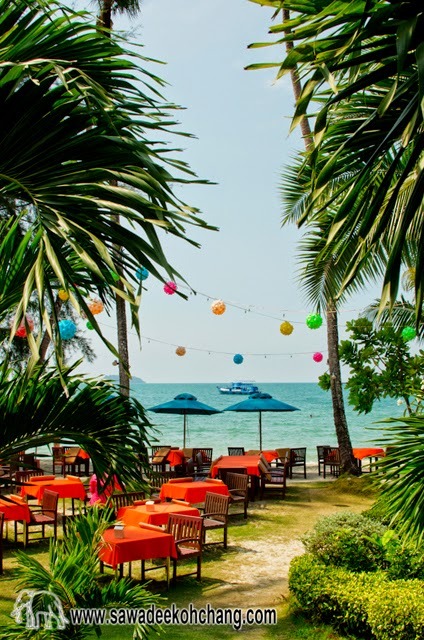 Depending of the seasons you can see jelly fishes. 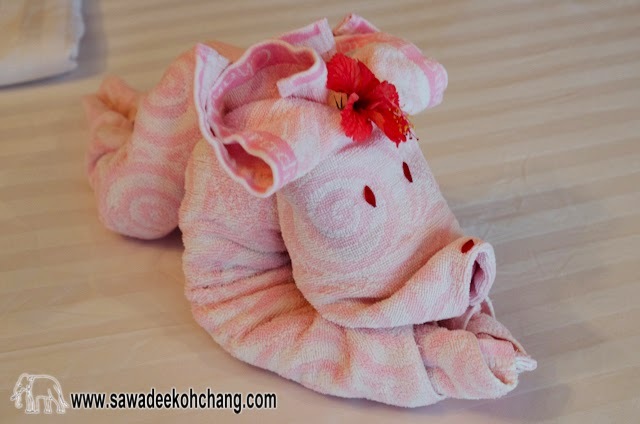 Normally they are very small and harmless but you never know. 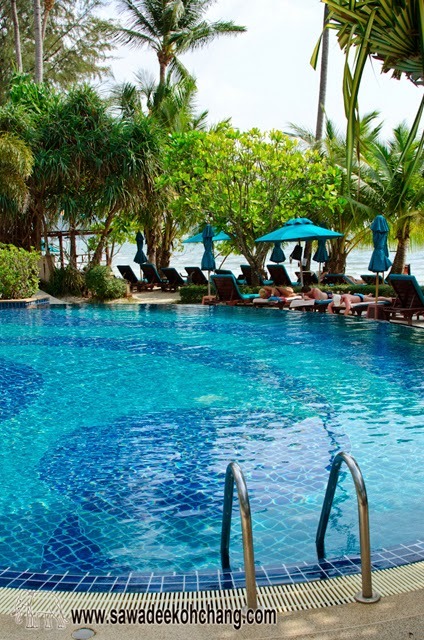 If you see one and if you are scared there is still the swimming pool which is facing the beach. 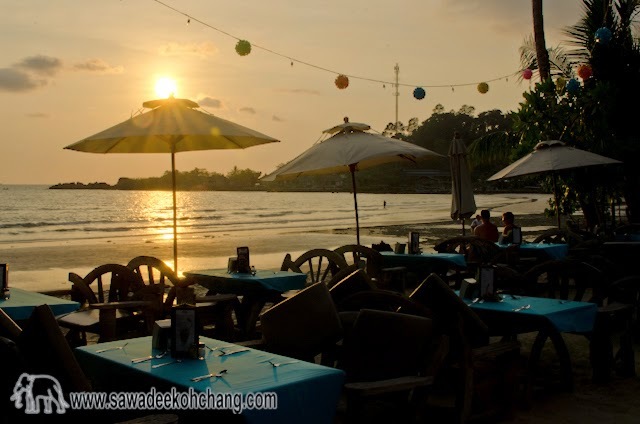 If you want to see a sunset until the end, the best is to walk to Chai Chet cape (2-3 minutes walk) otherwise from the resort's beach you will see it disappearing behind Chai Chet Resort. 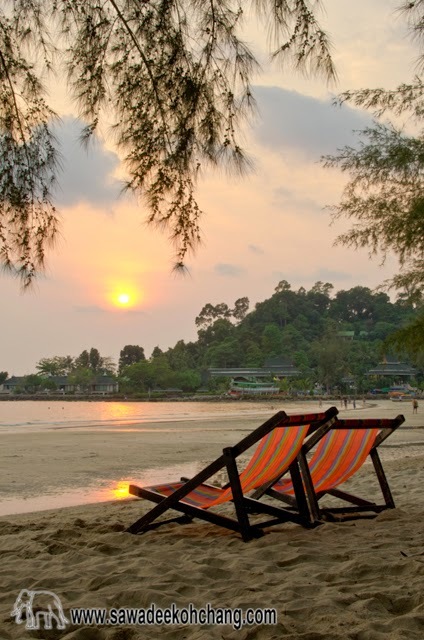 But it doesn't mean it won't be a nice sunset. 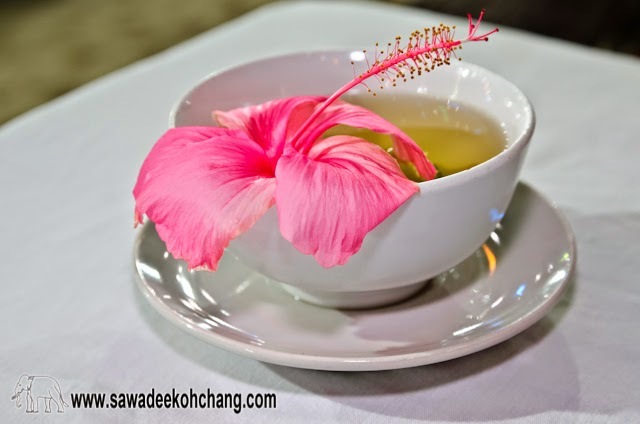 Watch the picture and judge by yourself! 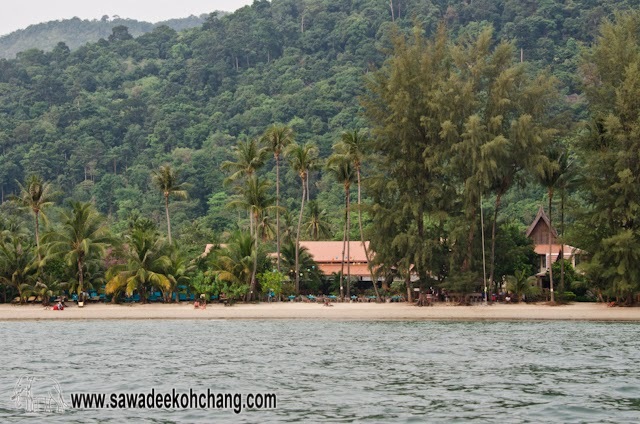 More pictures of the beach! 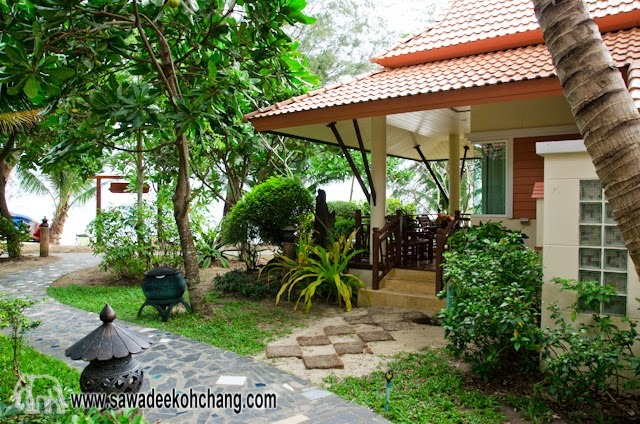 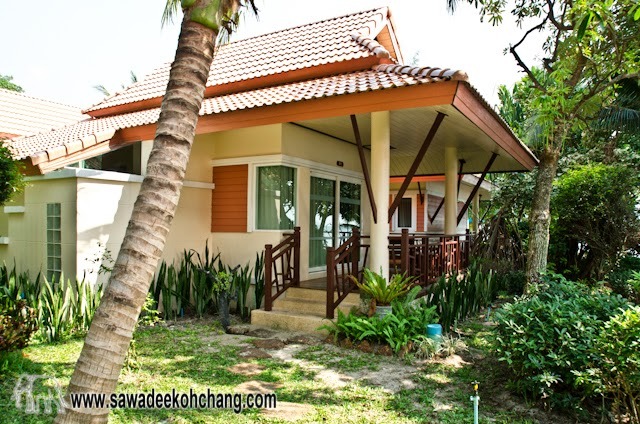 There are different types of bungalows: Superior and Superior Beach Front (24 m²), Deluxe and Deluxe Beach Front (32 m²). 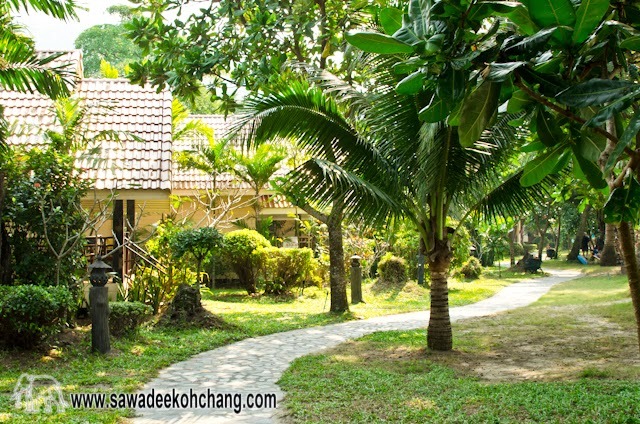 The Superior Bungalows have their private terrace with outdoor wooden furnitures, their own bathroom with a shower, hot and cold water, air-conditioning, a mini bar, tea and coffee products with a kettle, an electronic safe box, a hairdryer, bathrobes and slippers, free Wi-Fi, satellite TV and 2 free small bottles of drinking water added daily. 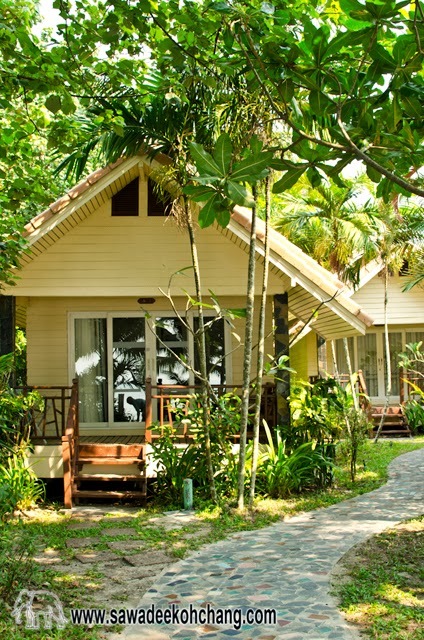 The Deluxe Bungalows are more spacious than the Superior Bungalows, they have extra equipment like a shower and a bathtub, air-conditioning and a ceiling fan over the bed and a DVD player (unfortunately there is a poor choice of old DVD available at the reception). 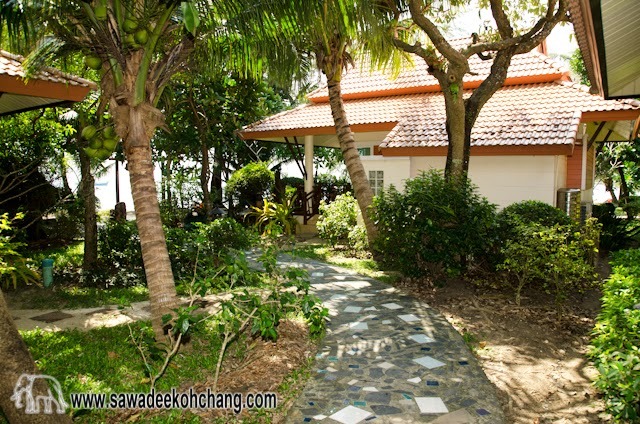 More pictures of the Bungalows! 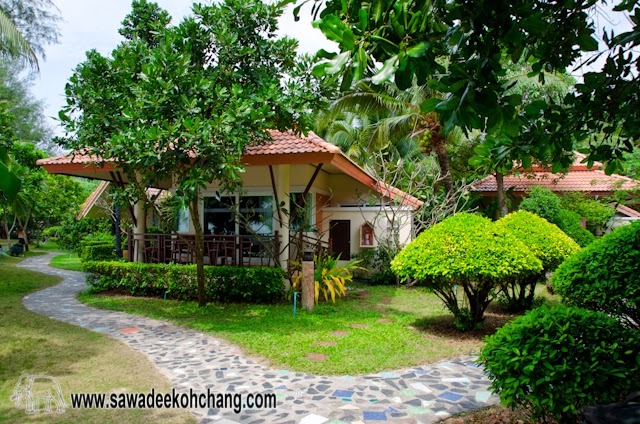 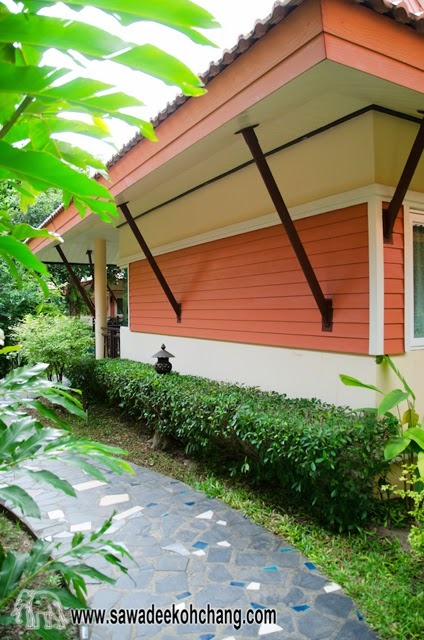 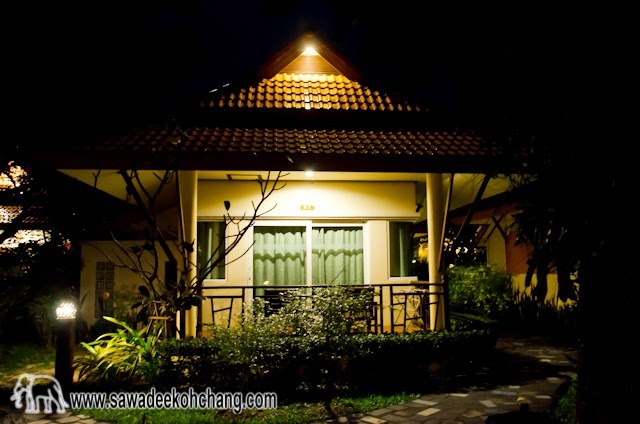 I would recommend the Deluxe Bungalows which are close to the beach and to the swimming-pool. 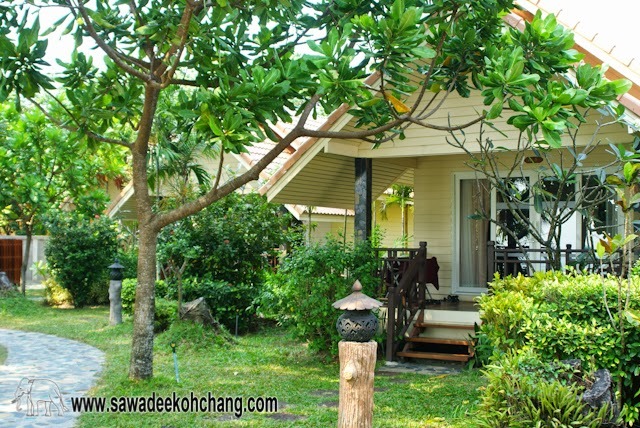 The Beach Front Bungalows are right in front of the beach but not on the beach which means you still have your privacy. 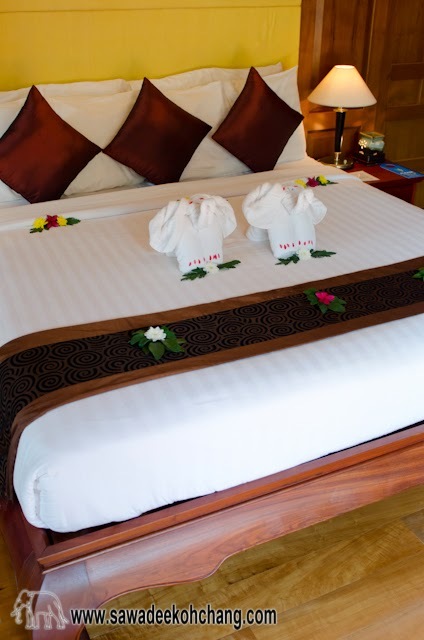 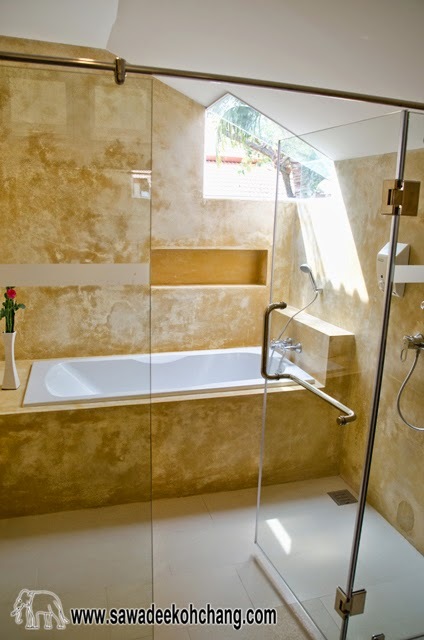 If your budget is higher then go for a Pool Villa, it's a small Eden, the room is spacious, similar to a Junior suite and you get your private pool with an outside Jacuzzi. 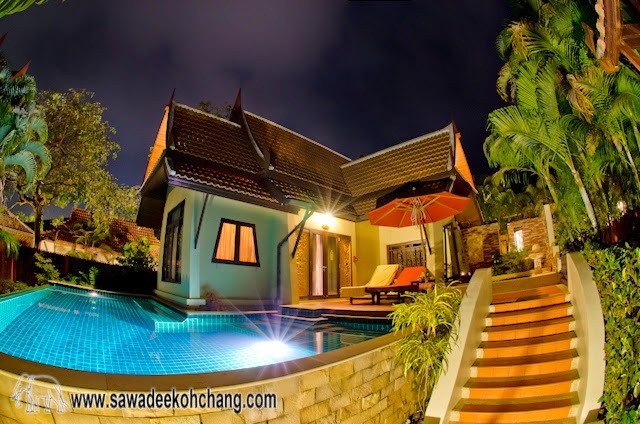 In the resort there are 12 Pool Villas of 3 different types: Family Pool Villa, Pool Villa and Beach Front Pool Villa. 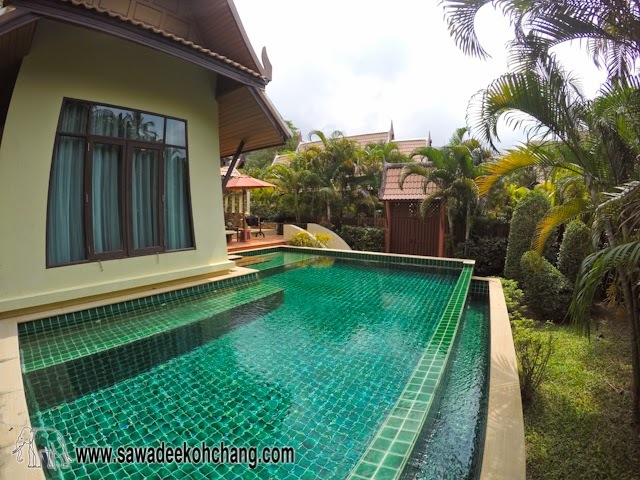 All Pool Villas have their private swimming pool with outdoor furnitures, their own high fences for your privacy, own outdoor and indoor showers, own sun beds, own private outdoor Jacuzzi, own bathroom with a shower (shower + indoor Jacuzzi for the Family Pool Villa), hot and cold water, air-conditioning, a mini bar, tea and coffee products with a kettle, an electronic safe box, a hairdryer, bathrobes and slippers, free Wi-Fi, satellite TV with a DVD player and home studio speakers and 2 free small bottles of drinking water added daily. 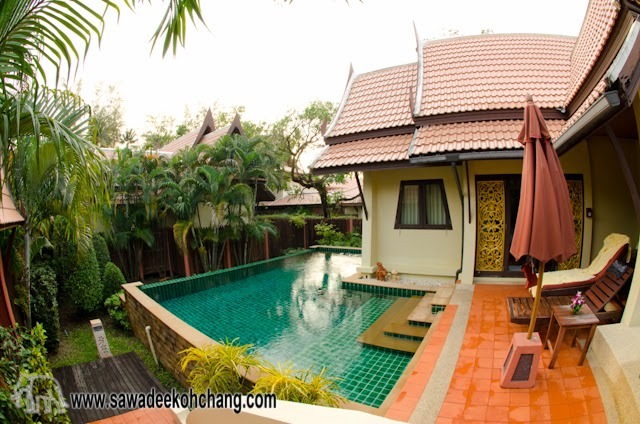 The 2 Family Pool Villas have 2 separated buildings joined by a private swimming pool. 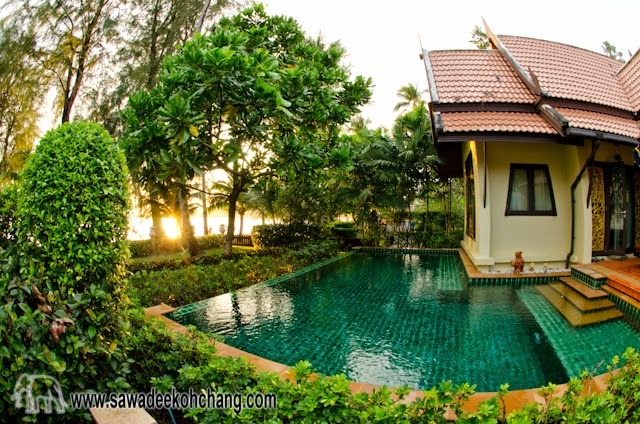 And there are 3 Beach Front Pool Villas right in front of the beach. 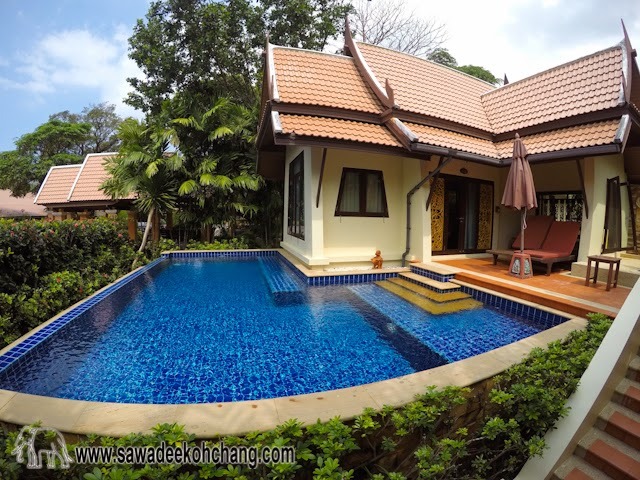 Their area is from 116 m² to 236 m² with a private swimming pool from 38 m² to 120 m² and are deep enough to jump and swim. 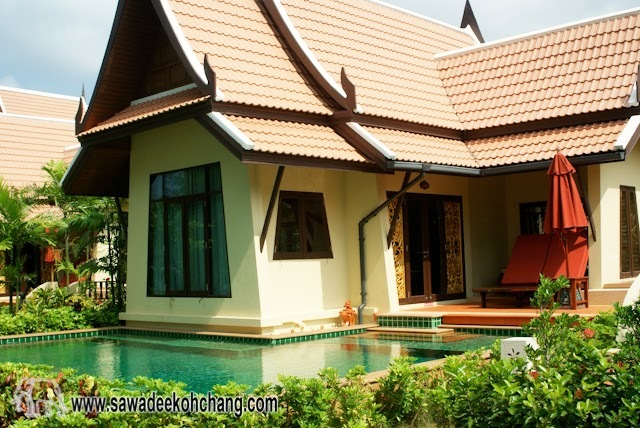 More pictures of the Pool Villas! 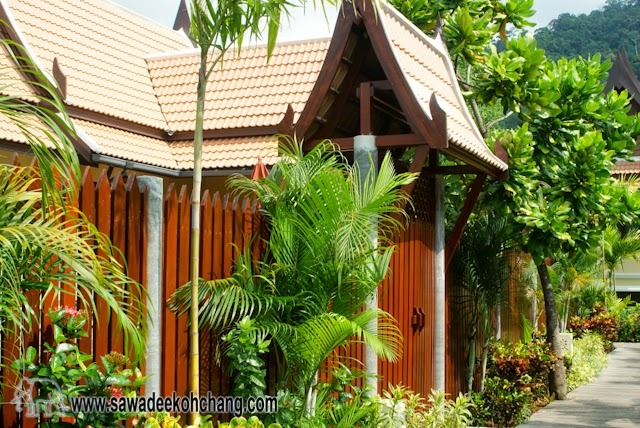 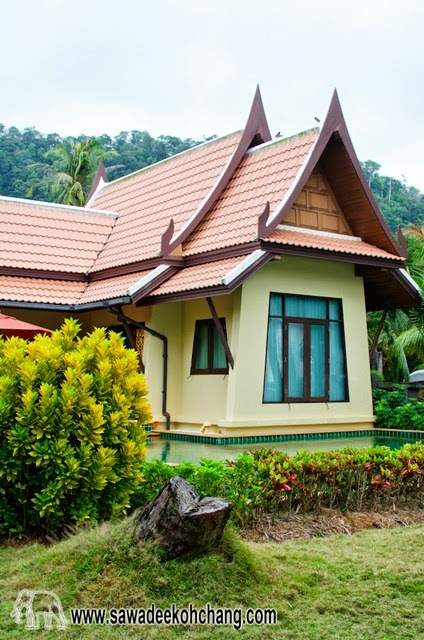 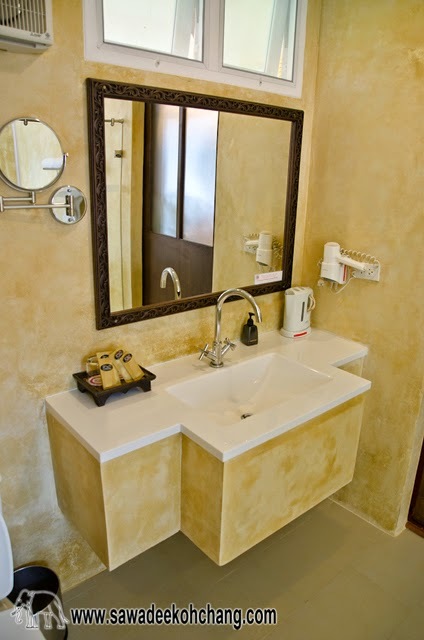 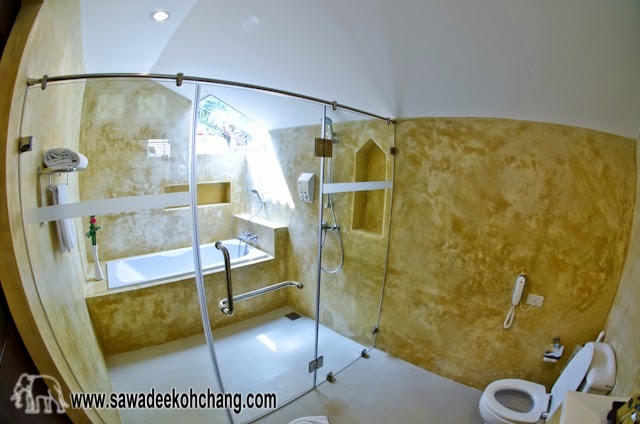 All Bungalows and Villas are cleaned daily and all can get a room-service. 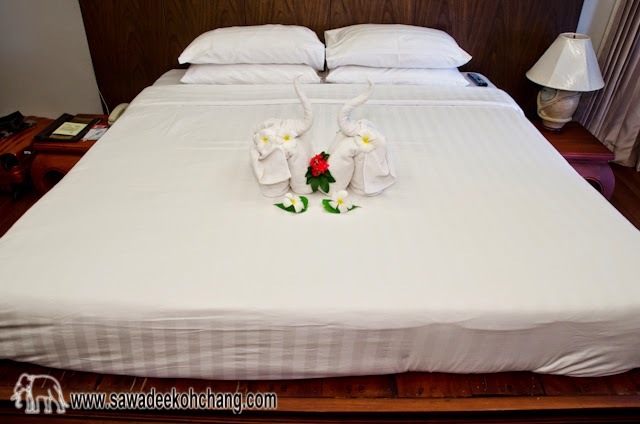 You can have a King-size bed or two single-size beds depending of the Bungalows and it's still possible to add an extra bed for a child. 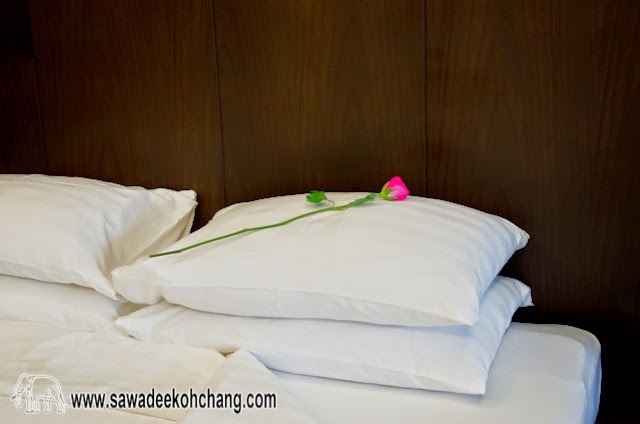 Mattresses are quite firm what I personally like and the bed sheets are cleaned and replaced at your convenience. 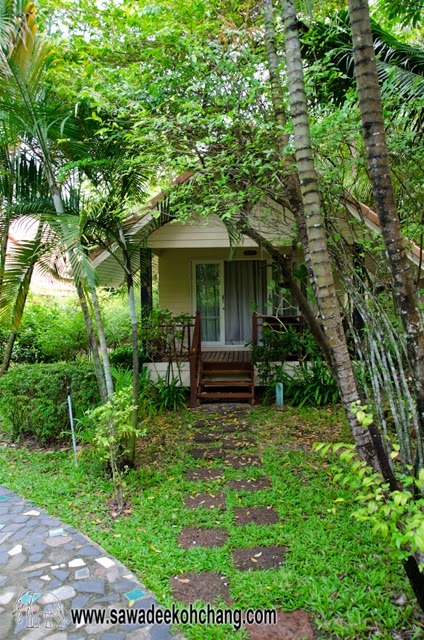 You have a lot of space inside the Bungalows, with small furnitures and a wardrobe to store your effects. 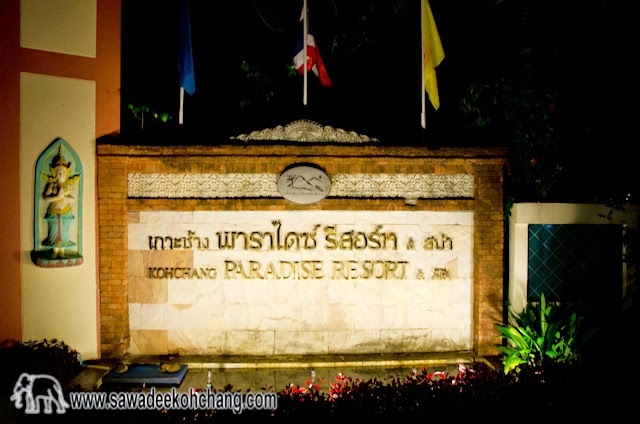 For your safety, there are lots of cameras in the resort and security men are patrolling by night. 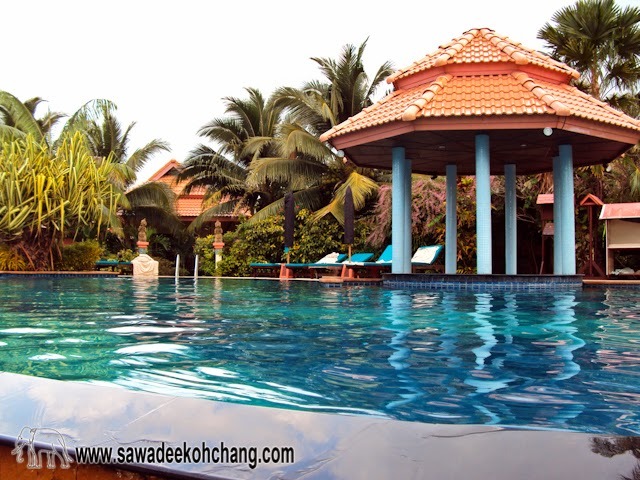 The swimming pool is right in front of the beach and between the beach restaurant and the bungalows. 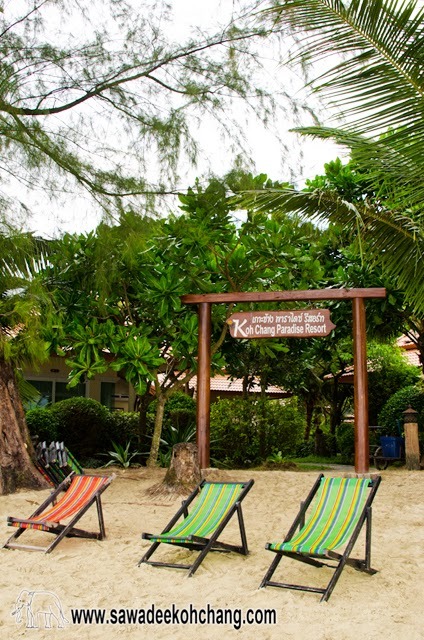 It's surrounded by wooden sun beds with comfortable mattresses and large umbrellas. 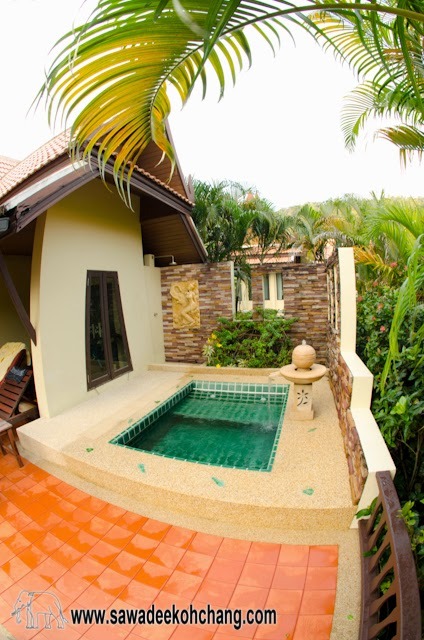 The pool is deep enough for an adult to swim with a small jacuzzi and a children pool. 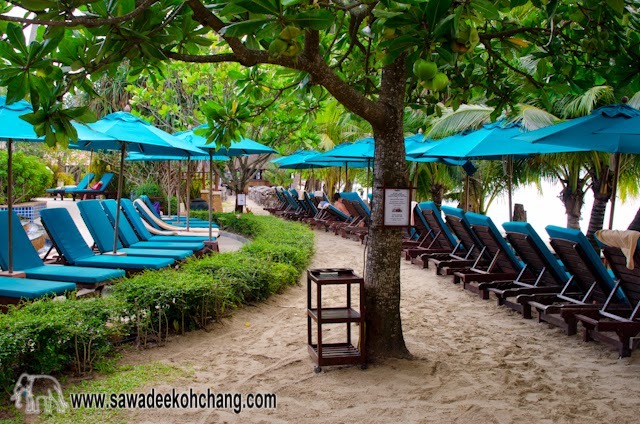 What I like in this resort, hotel guests cannot book sun beds in the morning. 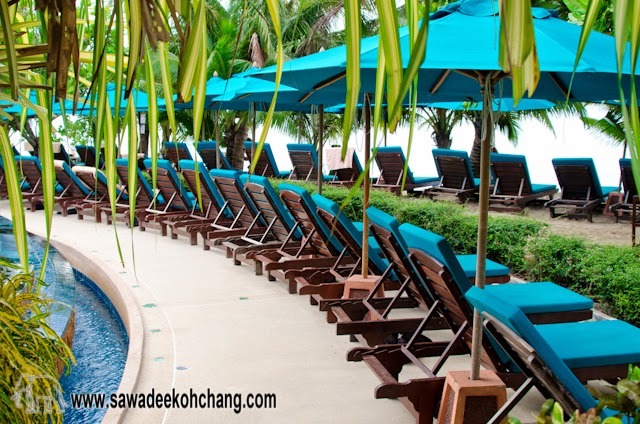 So you don't need to worry, stress and wake-up early to be sure to have a seat at the pool. 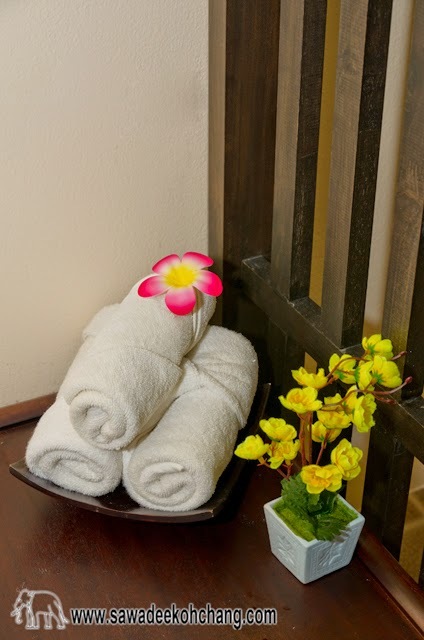 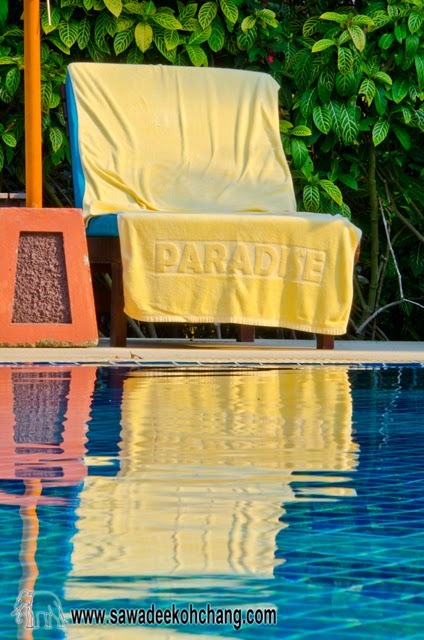 All towels or personal effects placed on chairs or sun beds to book them before 9AM will be immediately removed by the staff and brought to the reception. 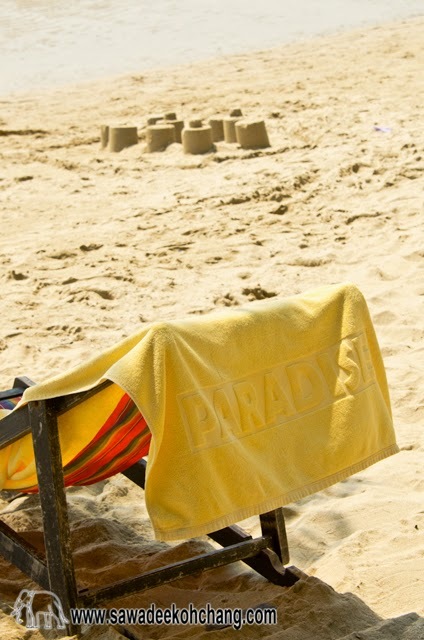 You can get at the reception almost as many clean beach towels as you want that you will return in the evening. 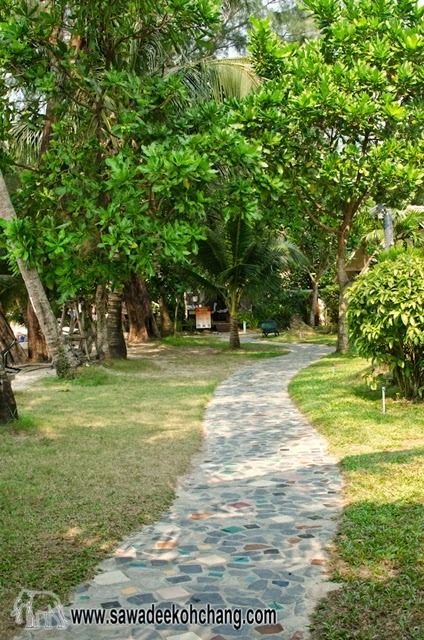 You just have to walk less than 10 meters to be on the beach which is very pleasant and convenient. 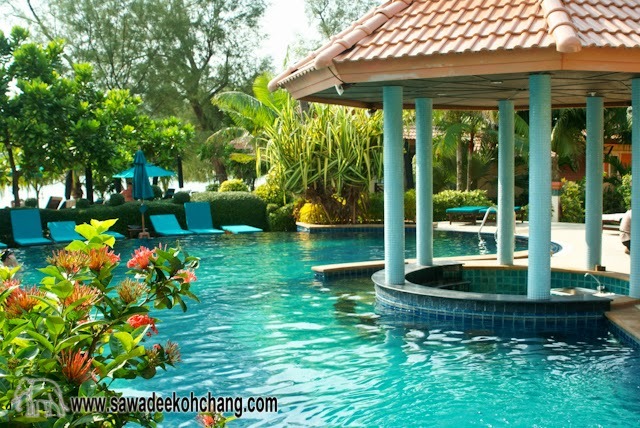 More pictures of the swimming-pool! 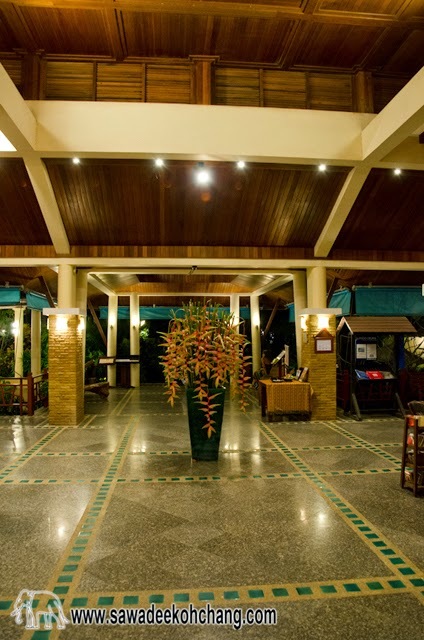 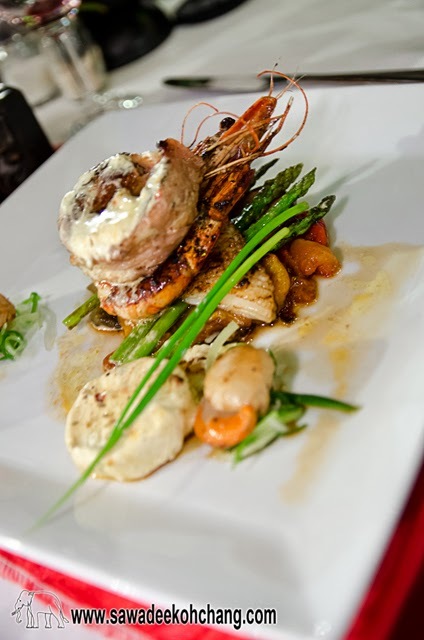 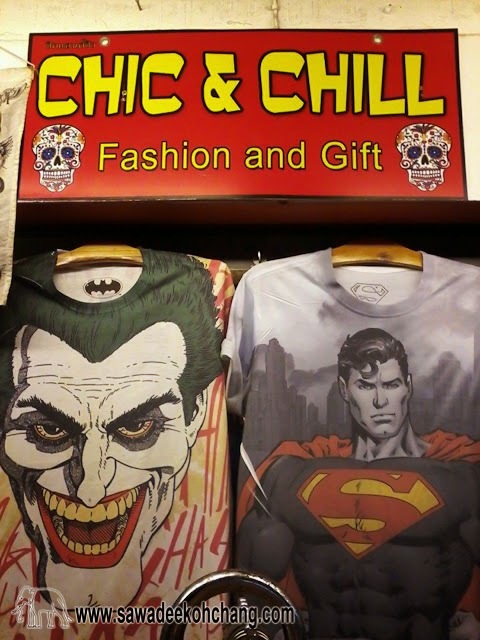 The staff is very helpful, polite and doing their best to please you. 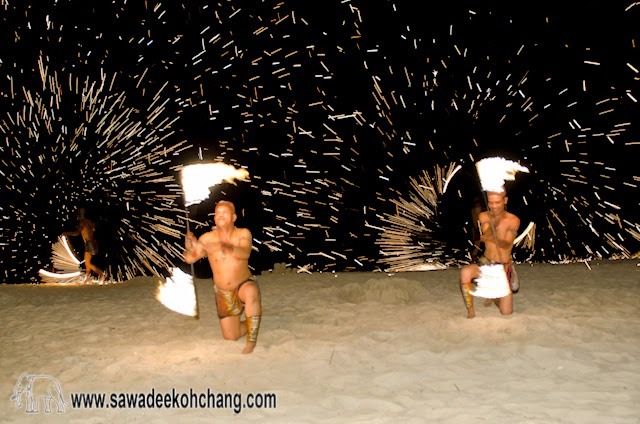 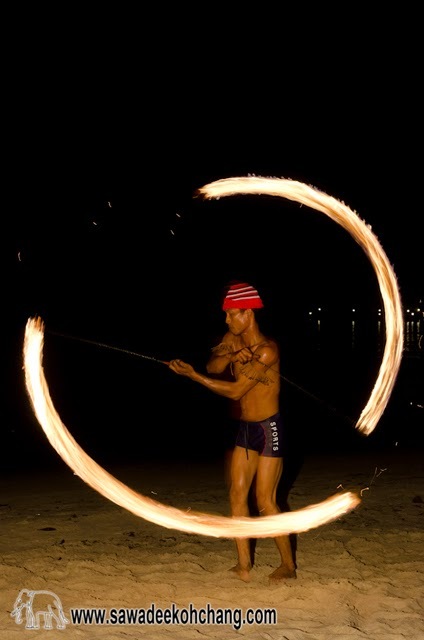 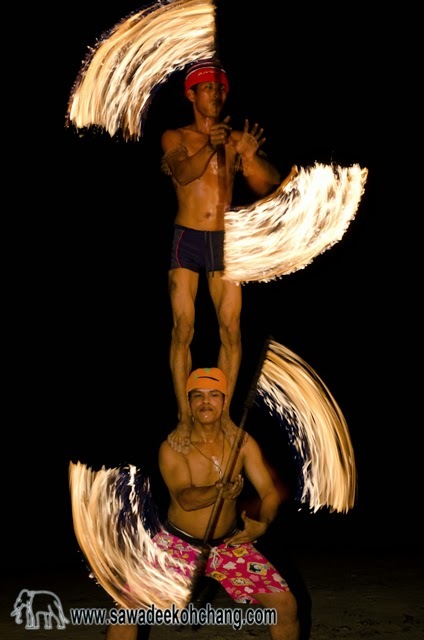 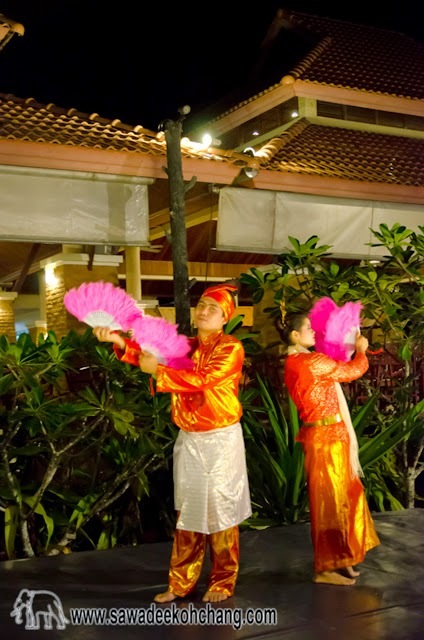 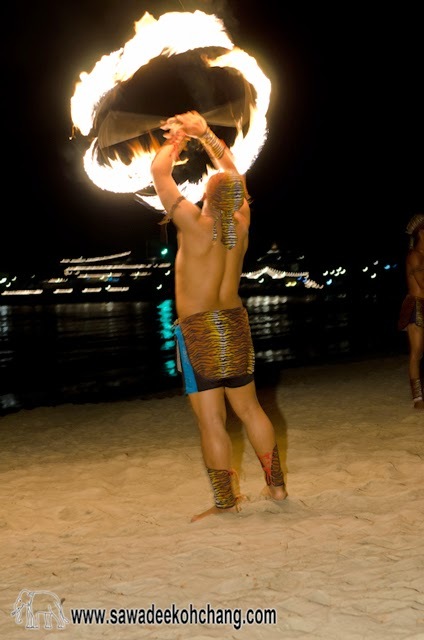 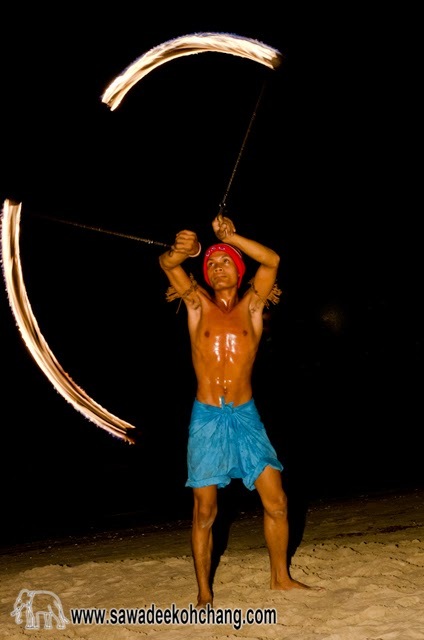 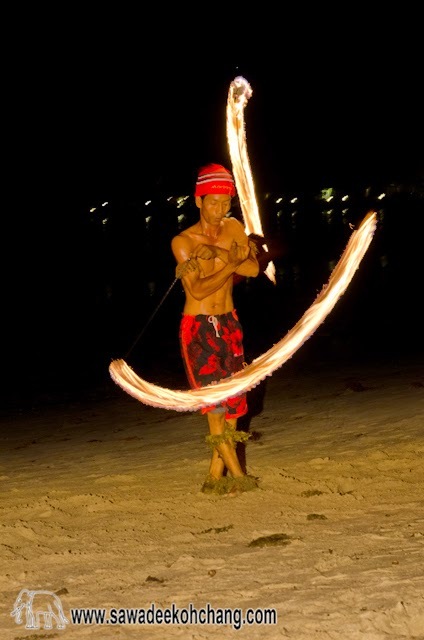 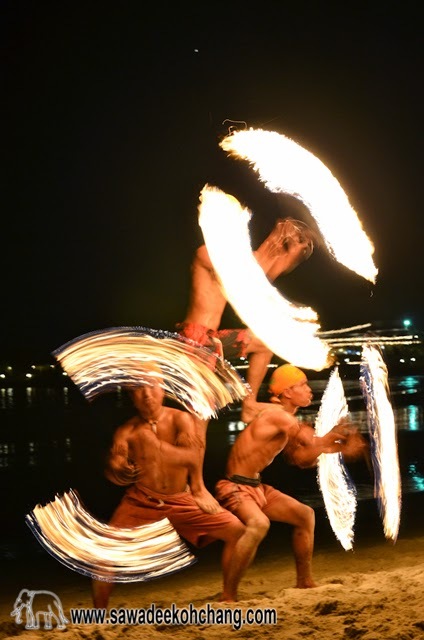 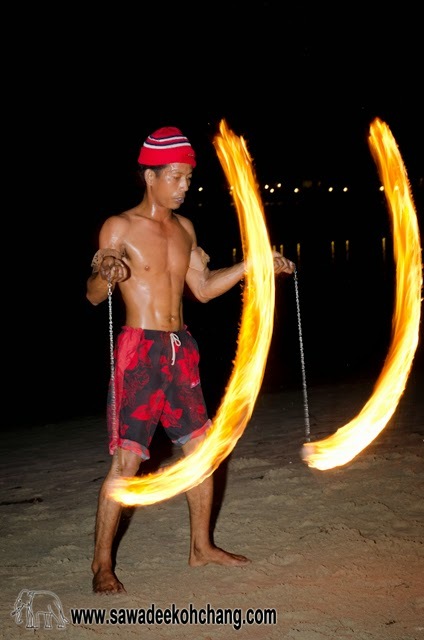 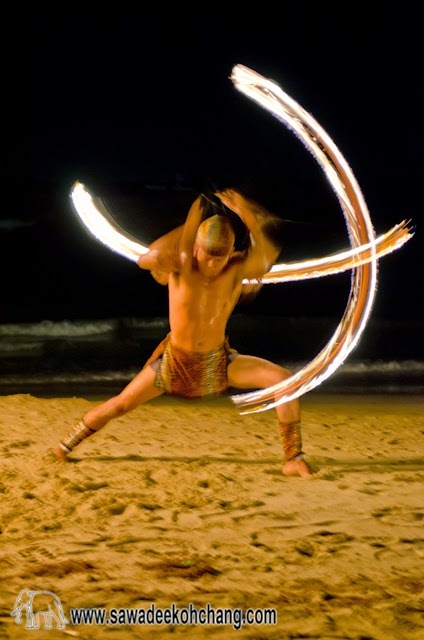 And few times a week during the high season they entertain you in the evening with their own show. 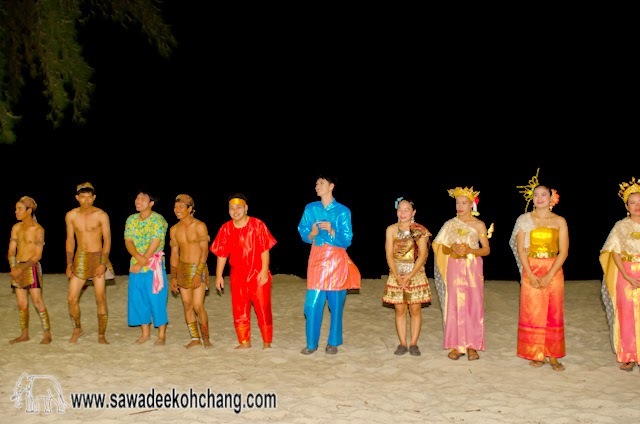 More pictures of the staff! 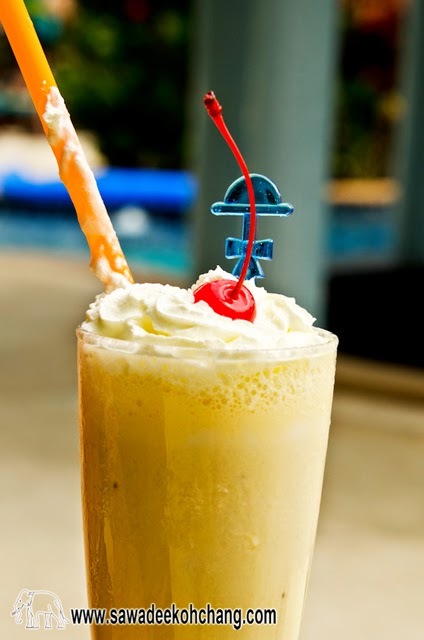 You can enjoy all kind of drinks or cocktails at the pool, at the beach or on your private terrace. 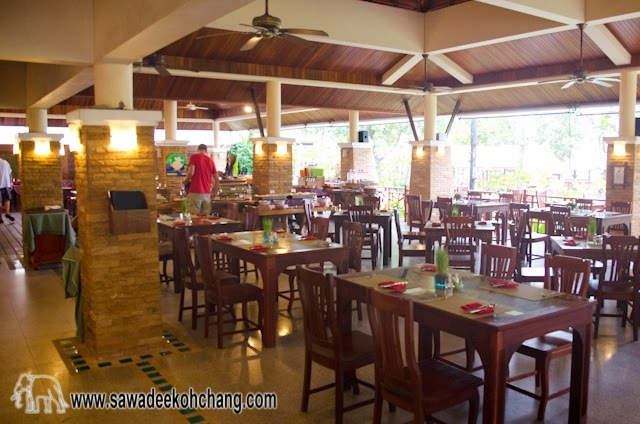 There are 2 restaurants in the resort, one indoor and one outdoor. 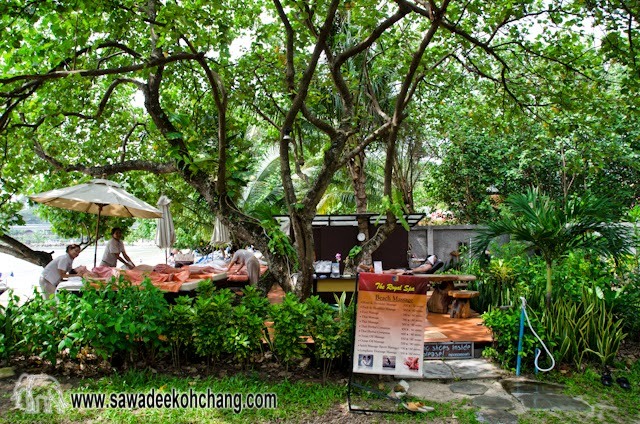 The indoor restaurant is used in the morning for the breakfast. 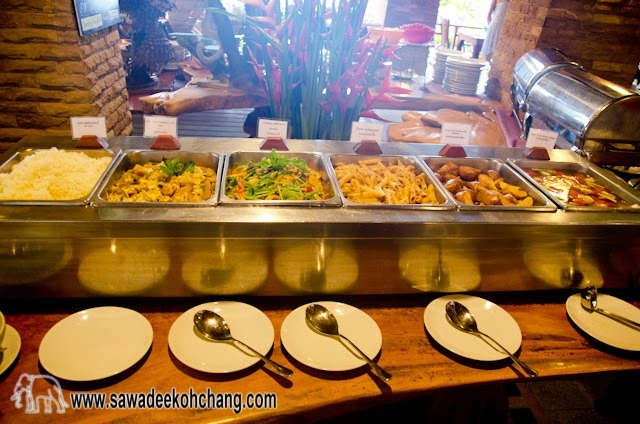 Do not stress to hurry up to be sure to have a place, it's big enough to fit all the resort's guest and there will be enough food too. 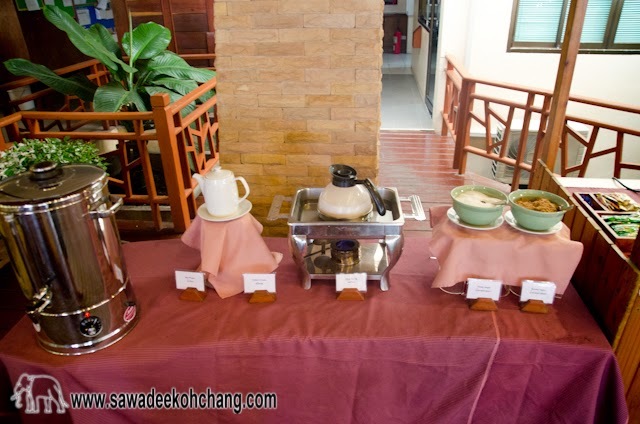 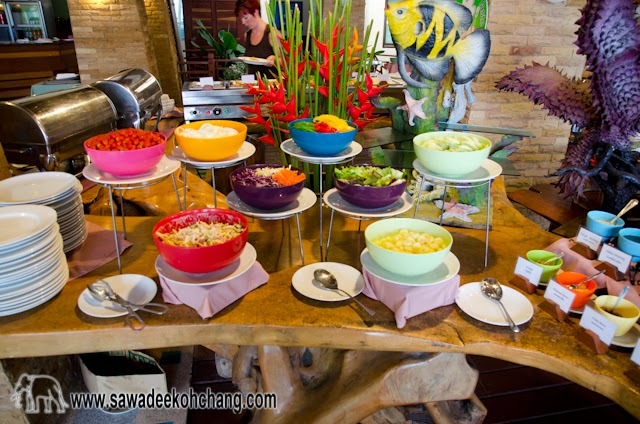 - In the middle there is the continental buffet filled with cheese, ham, salad, tomatoes, cereals, fresh fruits, soup and thai food. 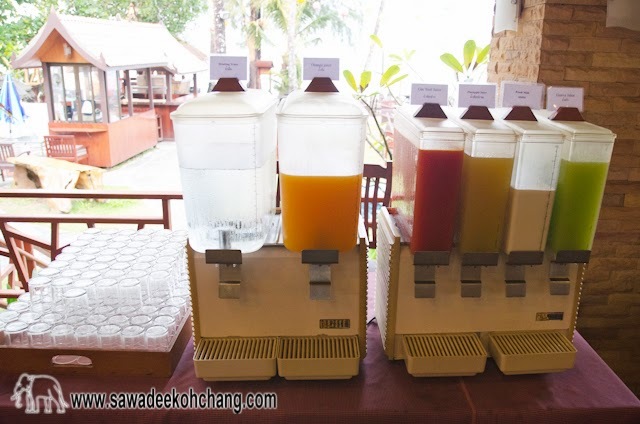 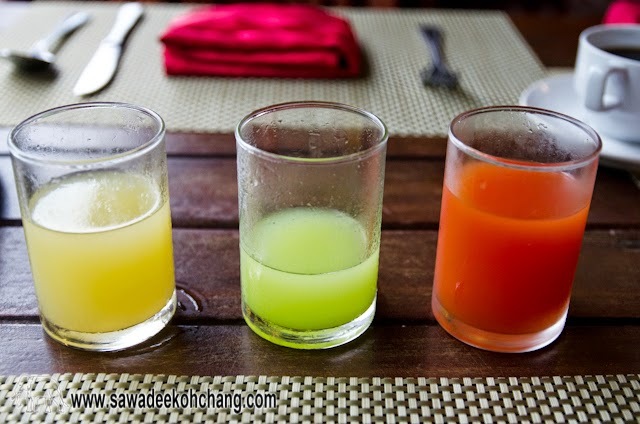 - On the beach side, there are cold water, cold milk and a choice of different fruit juices. 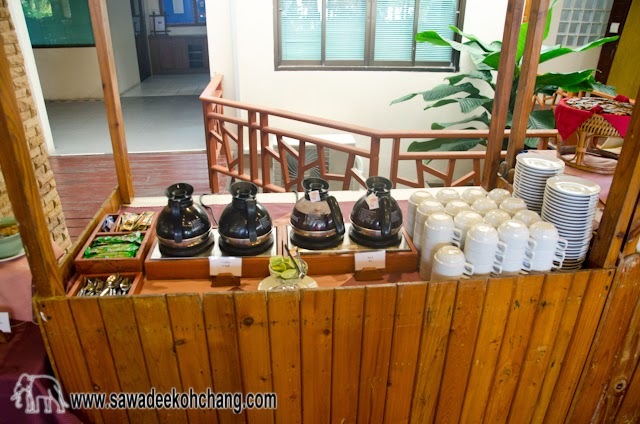 - Opposite side of the juices is another buffet with coffee, tea, warm milk, croissants, toasts and toaster, bread, jams, banana cake and butter. 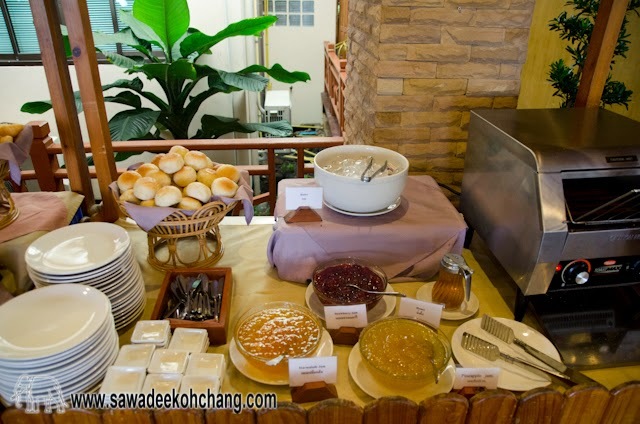 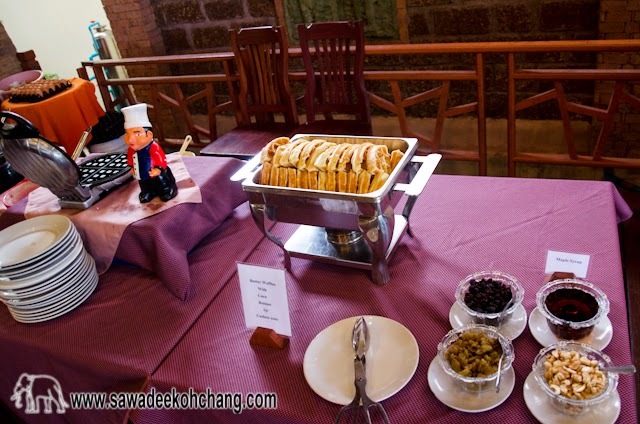 - Then the last buffet close to the toasters with boiled eggs, fresh made waffles, and well garnished omelettes done as your request. 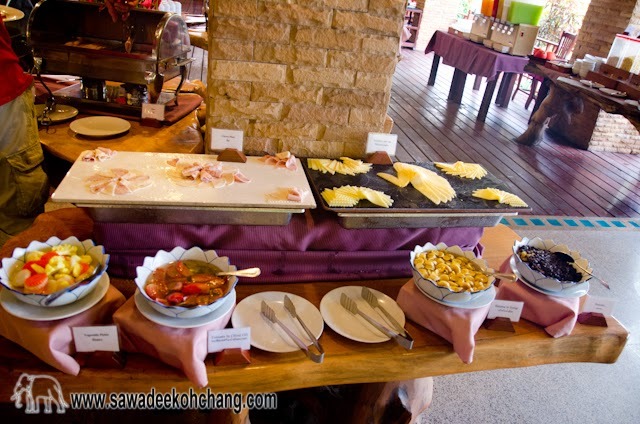 More pictures of the breakfast buffetl! 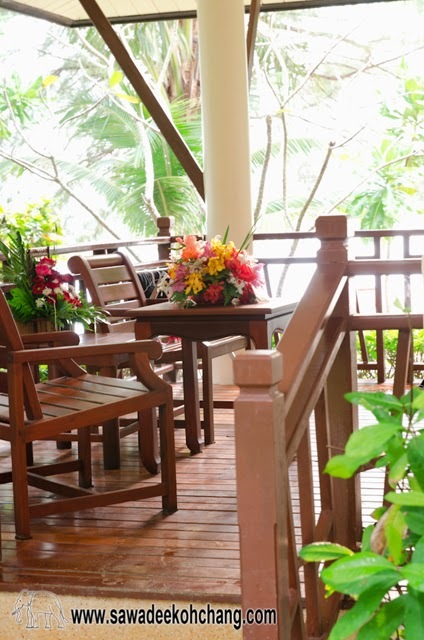 In the day time it's possible to take your lunch or even the dinner in the indoor restaurant if you prefer to be in the complete shadow or if it's raining. 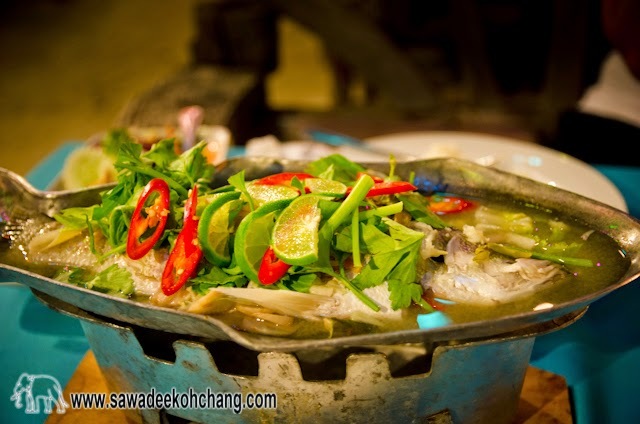 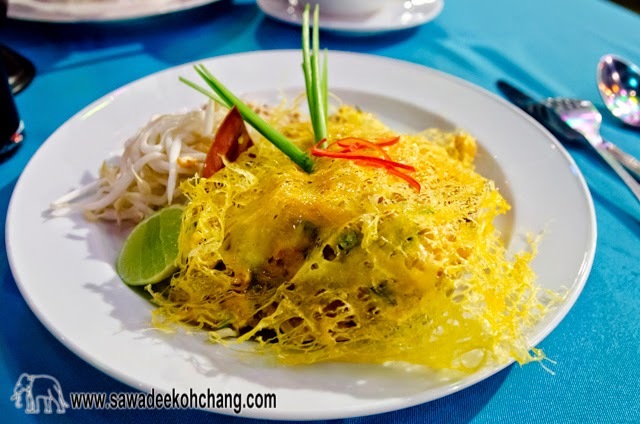 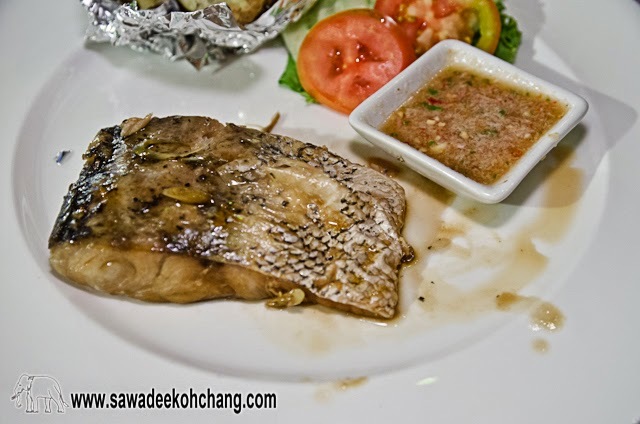 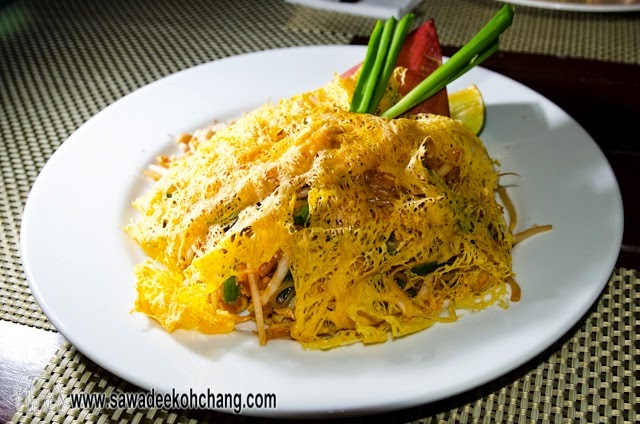 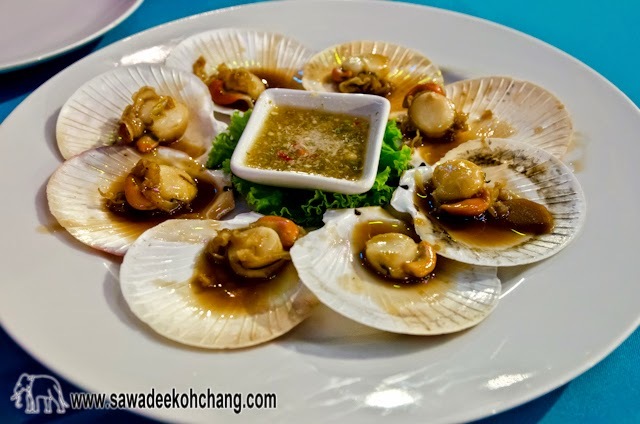 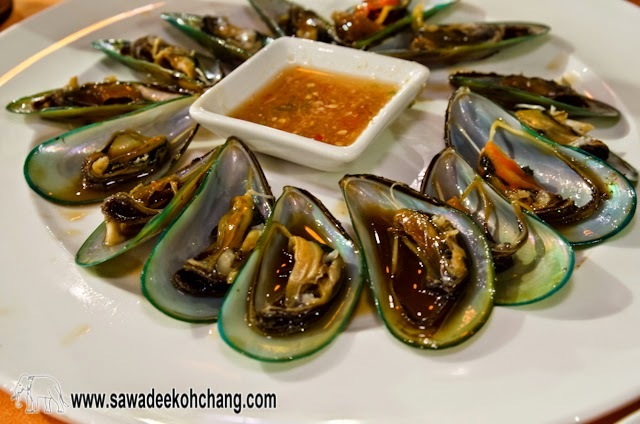 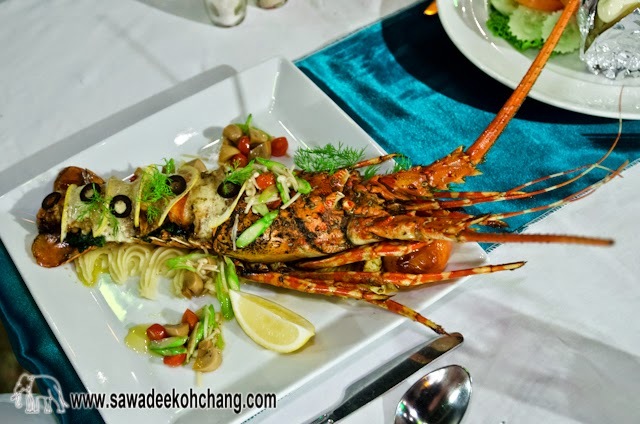 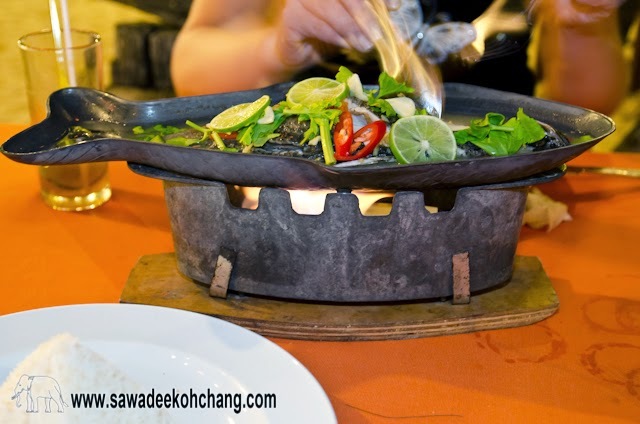 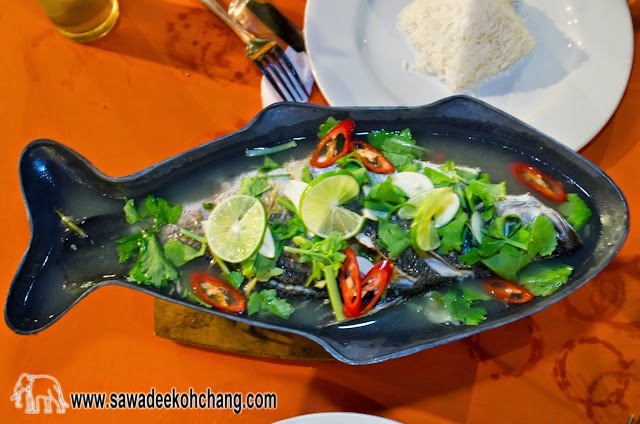 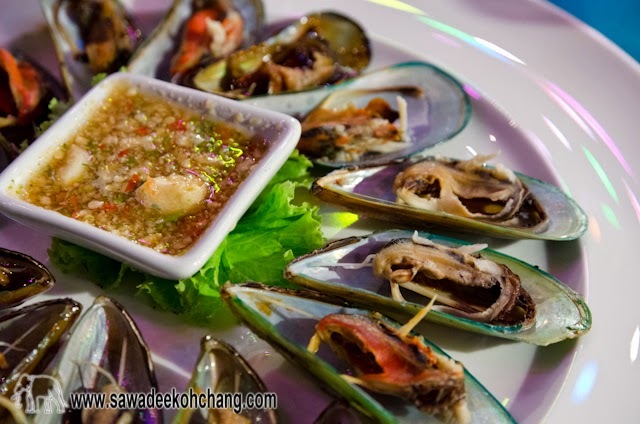 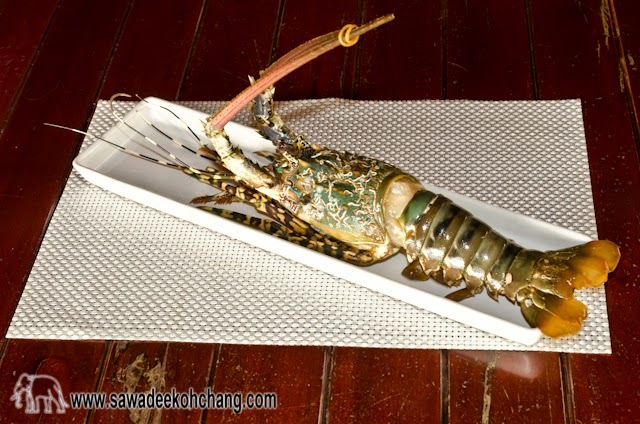 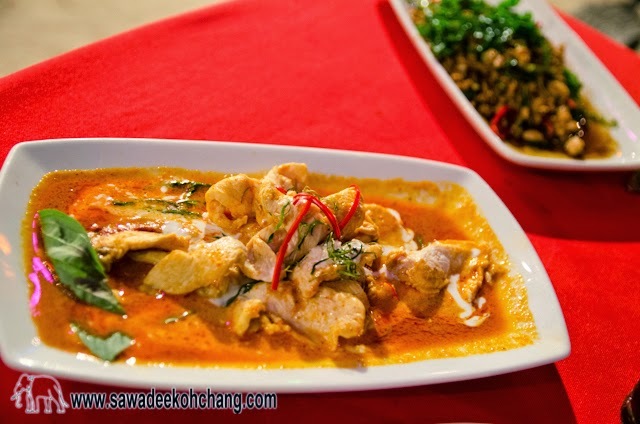 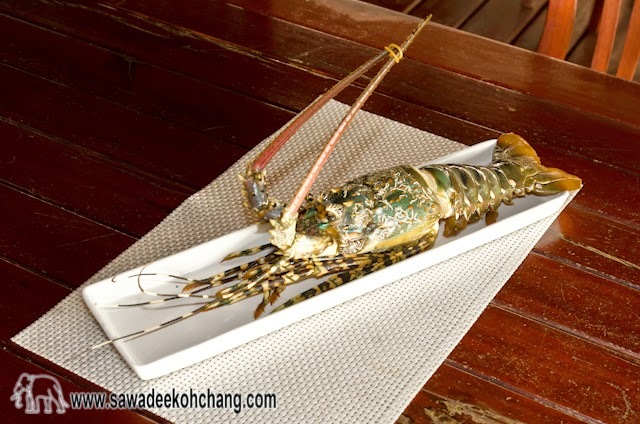 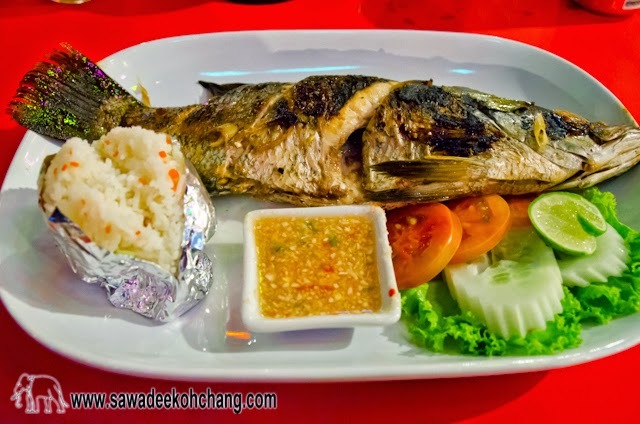 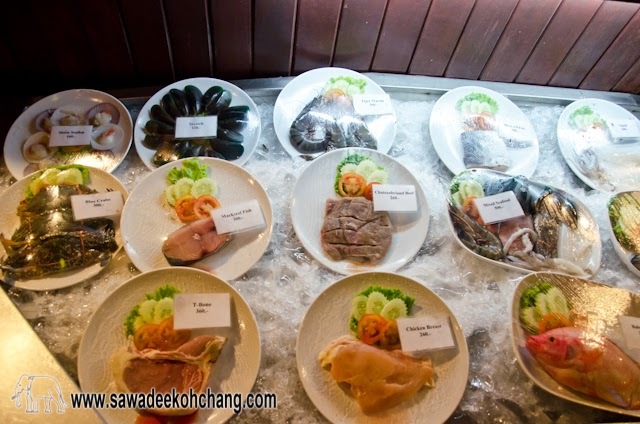 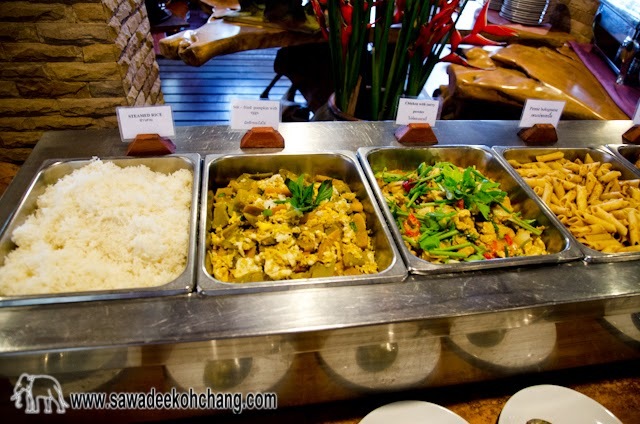 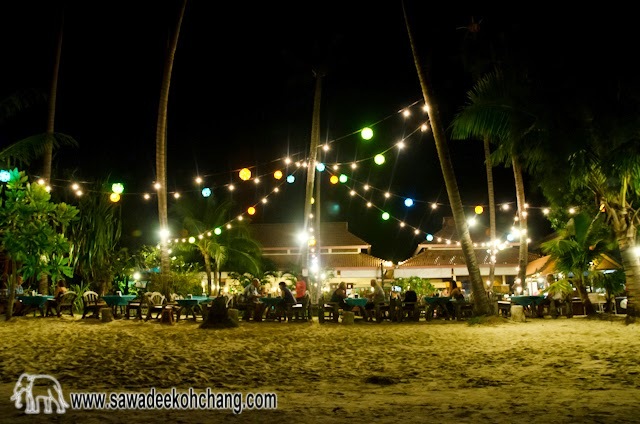 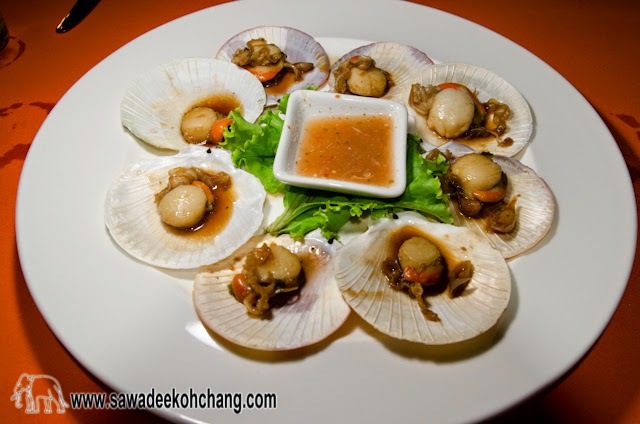 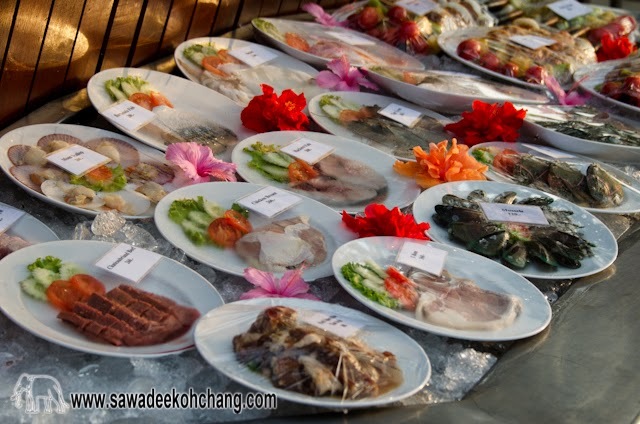 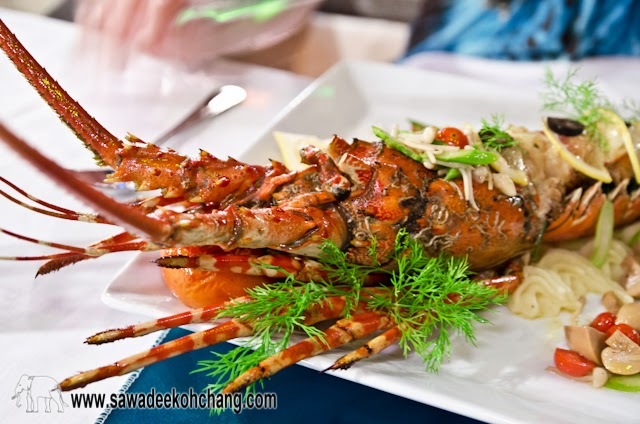 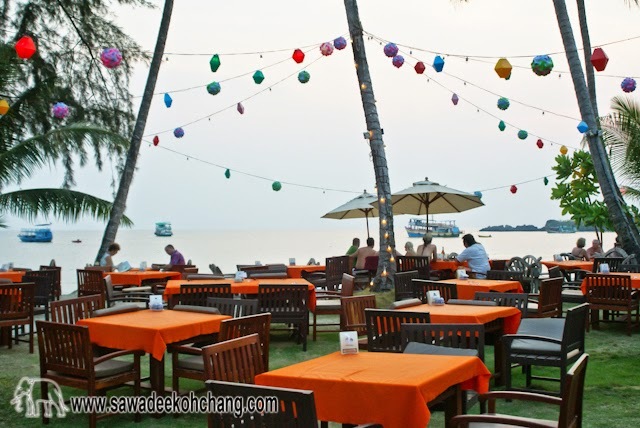 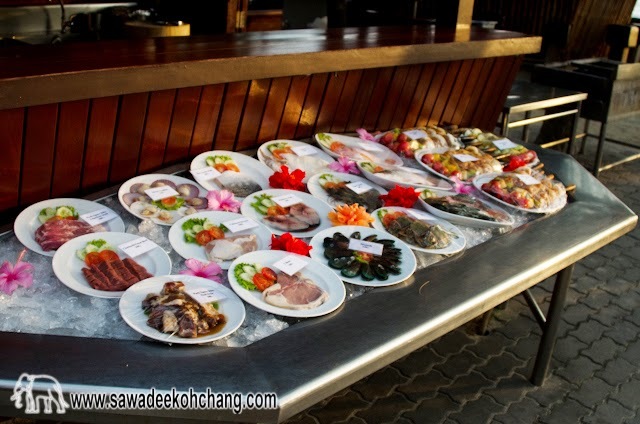 The beach restaurant is serving Thai and Western food, and every evening there is a selection of fresh sea food. 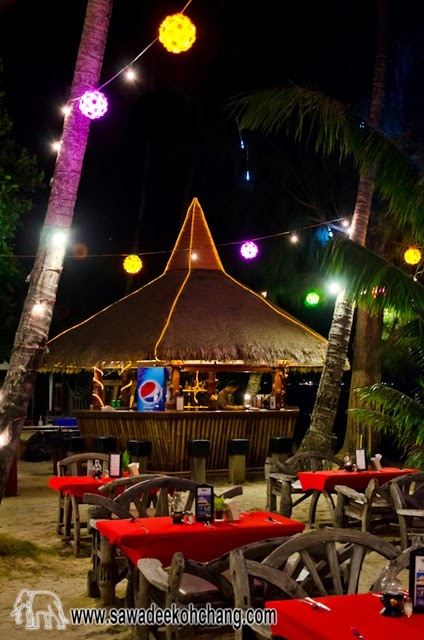 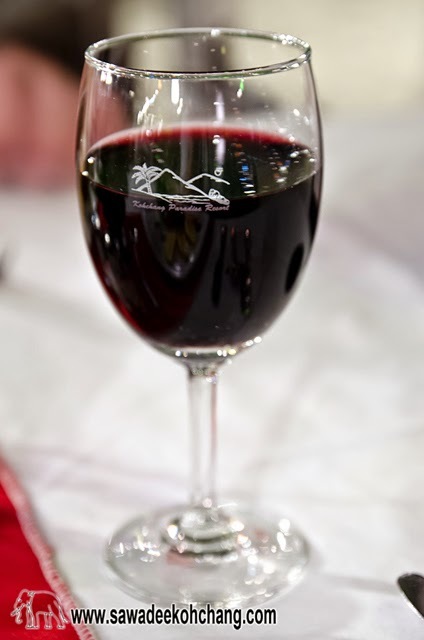 And remember that all Resort's guests get 10% discount on the food and drinks and 20% off the drinks everyday during their Happy Hour which is from 5.00pm to 6.00pm, which makes it cheaper than all the others around. 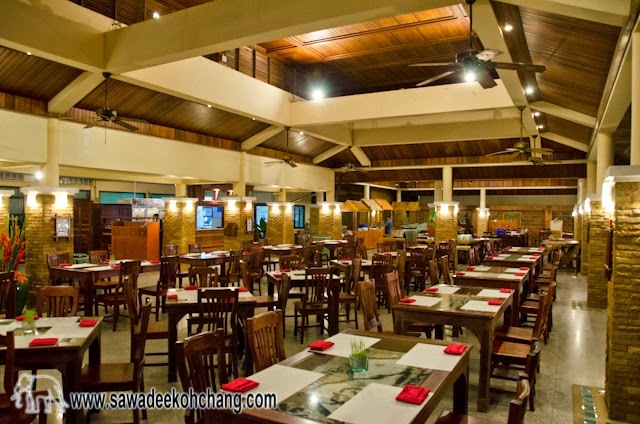 More pictures of the restaurant! 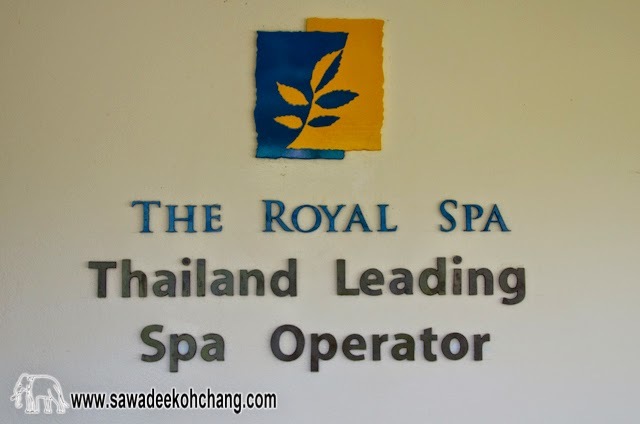 The Spa is located in two different places in the resort. 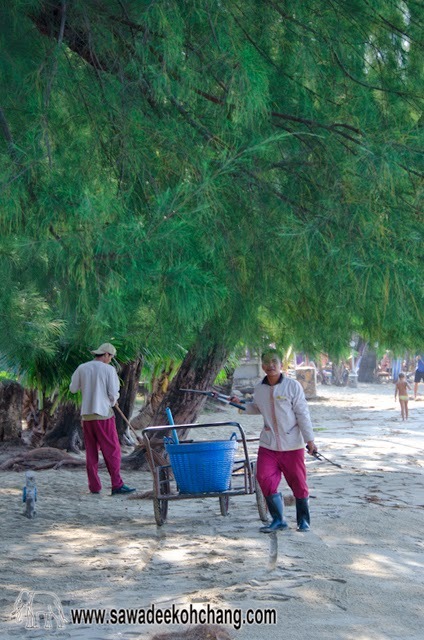 Near the beach and near the restaurant. 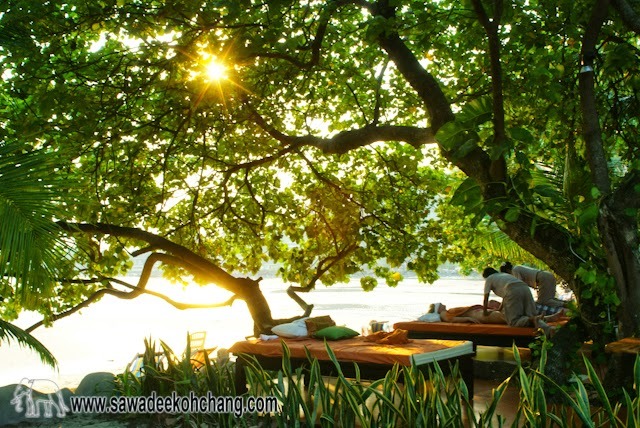 At the edge of the beach, under the big trees, you can relax and get different type of massages. 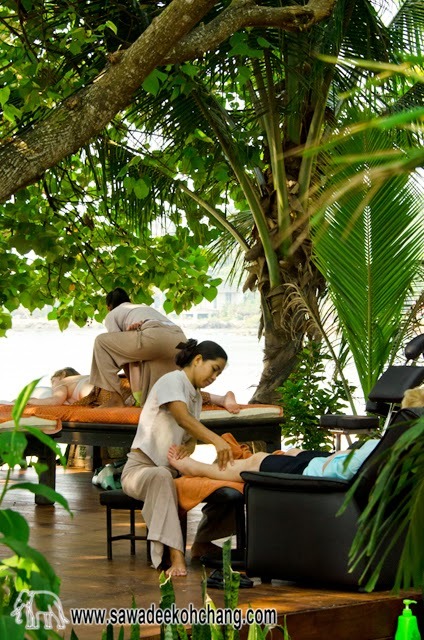 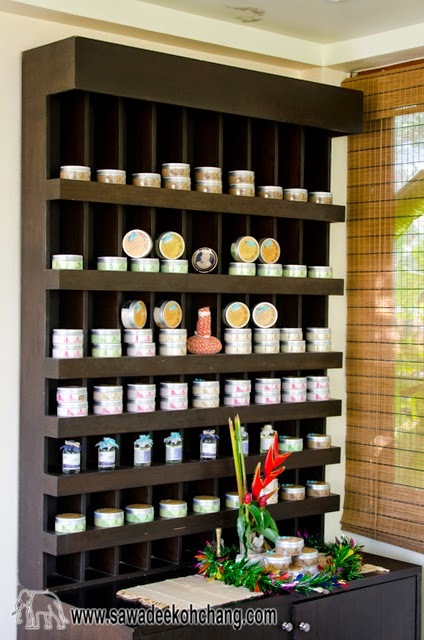 Near the restaurant, the Spa proposes different treatments, from 45 minutes to 5 hours. 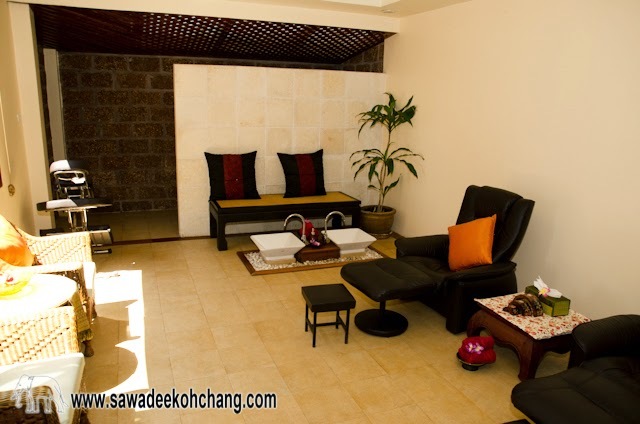 More pictures of the Spa! 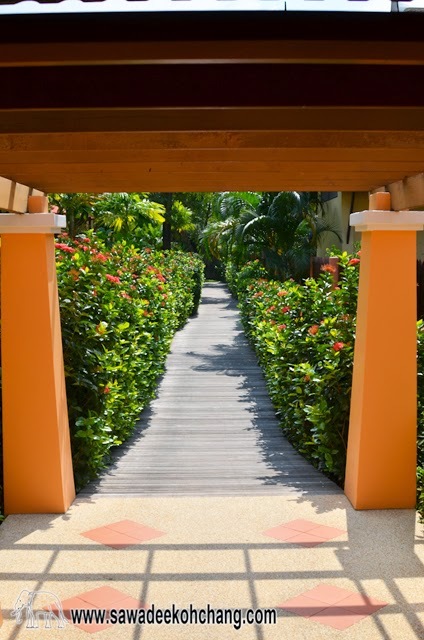 Since November 2016, the resort has a brand new fitness centre which is available only for the guests and for free. 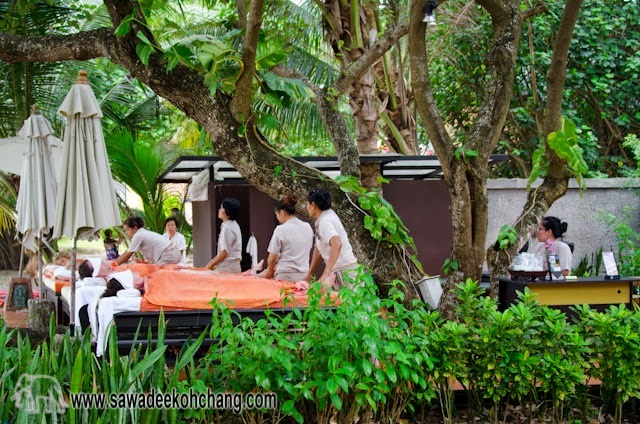 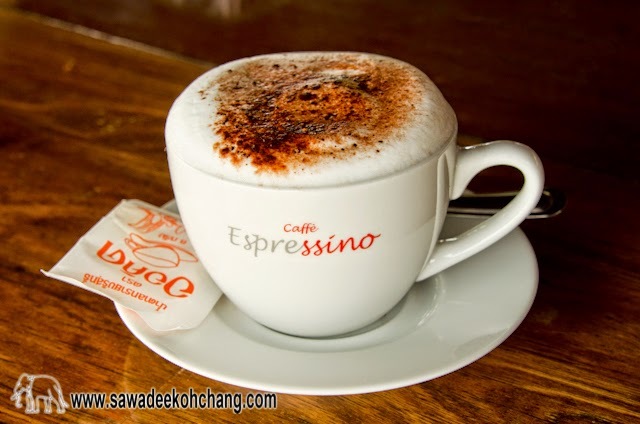 They are using professional equipment and it's opened daily from 6.00 am to 8.00 pm. 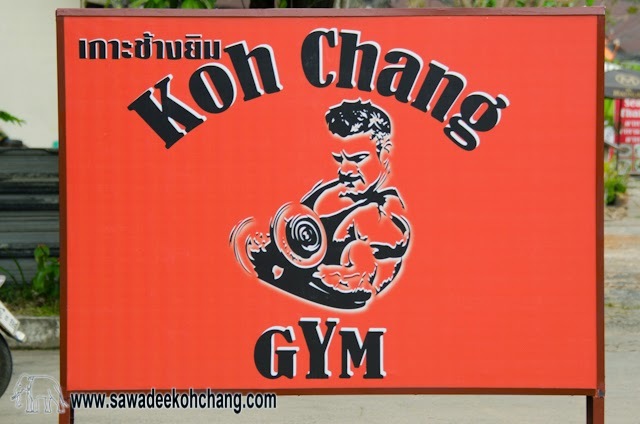 More pictures of the Fitness Center! 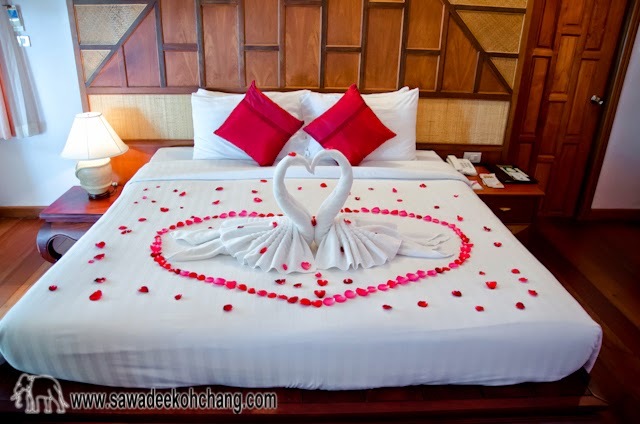 If you are planning to spend your honeymoon, don't forget to mention it during your booking, you will get a nice surprise!